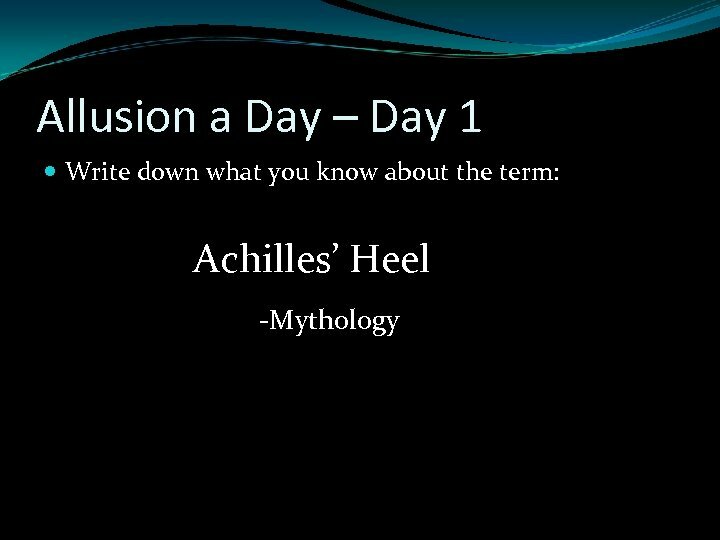 Achilles’ Heel This term comes from Greek Mythology. According to myth, when Achilles was a baby, his mother dipped him in the River Styx because the waters from this river gave immortality to humans. His mother held him by his heel, so that was the only place on his body not touched by the water. 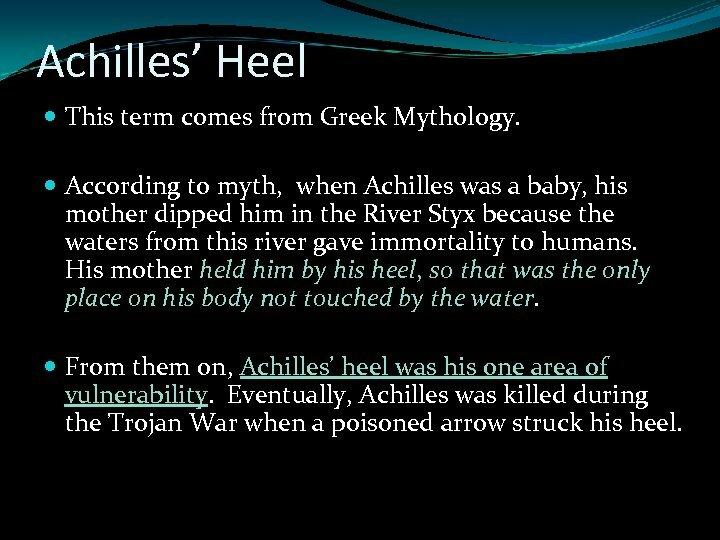 From them on, Achilles’ heel was his one area of vulnerability. Eventually, Achilles was killed during the Trojan War when a poisoned arrow struck his heel. 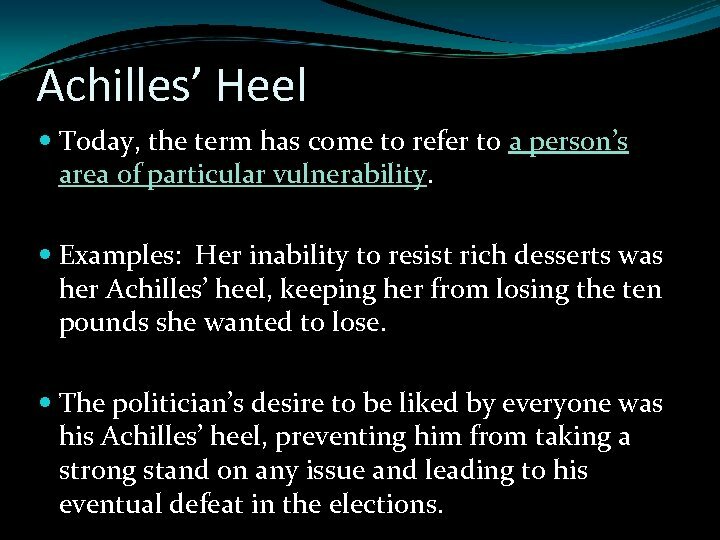 Achilles’ Heel Today, the term has come to refer to a person’s area of particular vulnerability. 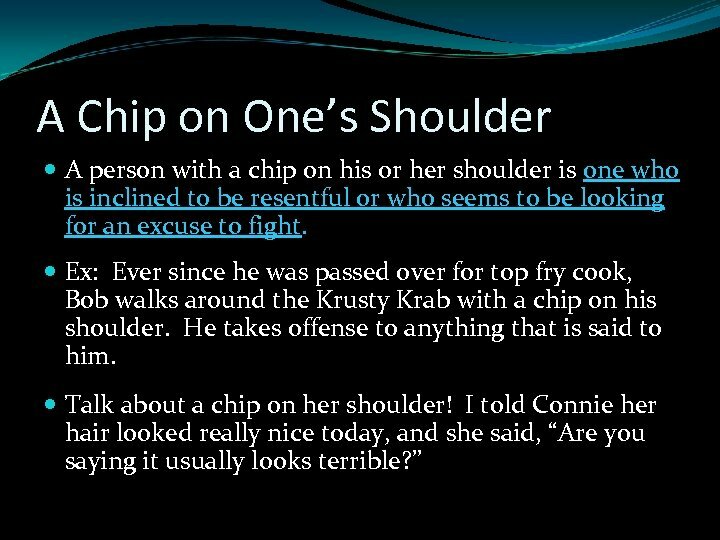 Examples: Her inability to resist rich desserts was her Achilles’ heel, keeping her from losing the ten pounds she wanted to lose. The politician’s desire to be liked by everyone was his Achilles’ heel, preventing him from taking a strong stand on any issue and leading to his eventual defeat in the elections. 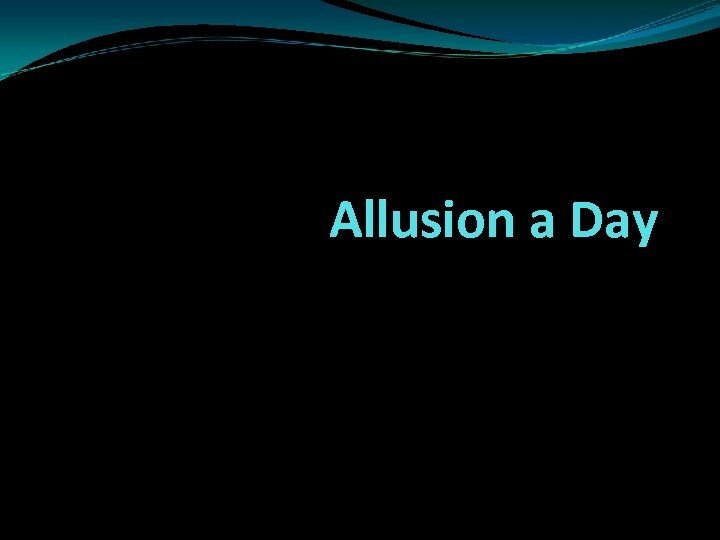 Allusion a Day Pound of Flesh This phrase comes from Shakespeare’s Merchant of Venice. In this play, Shylock, a moneylender, agrees to finance a fleet of ships for a young merchant, Antonio. In the contract, Shylock demands a pound of flesh as payment should anything happen to the ships. 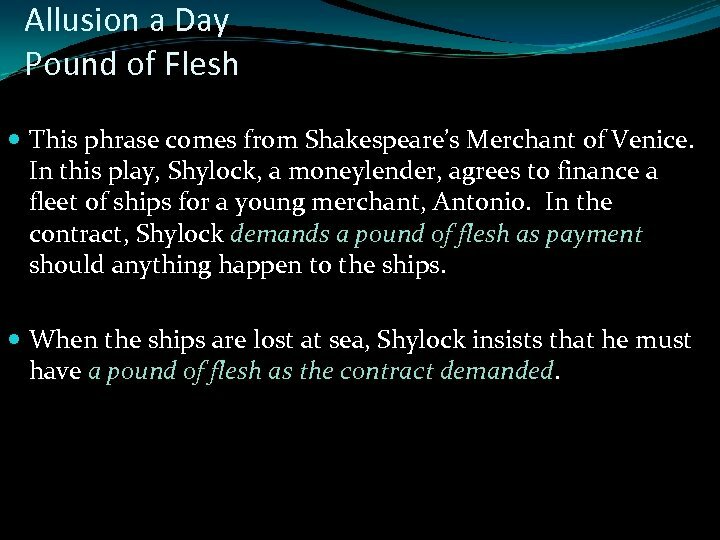 When the ships are lost at sea, Shylock insists that he must have a pound of flesh as the contract demanded. 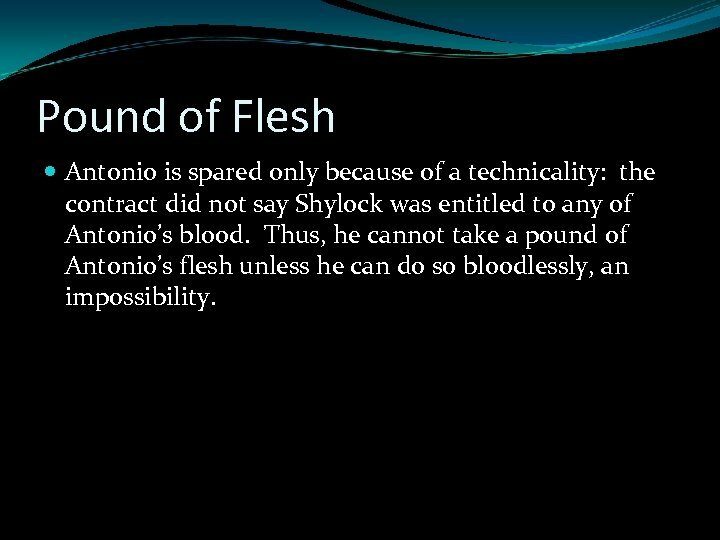 Pound of Flesh Antonio is spared only because of a technicality: the contract did not say Shylock was entitled to any of Antonio’s blood. Thus, he cannot take a pound of Antonio’s flesh unless he can do so bloodlessly, an impossibility. 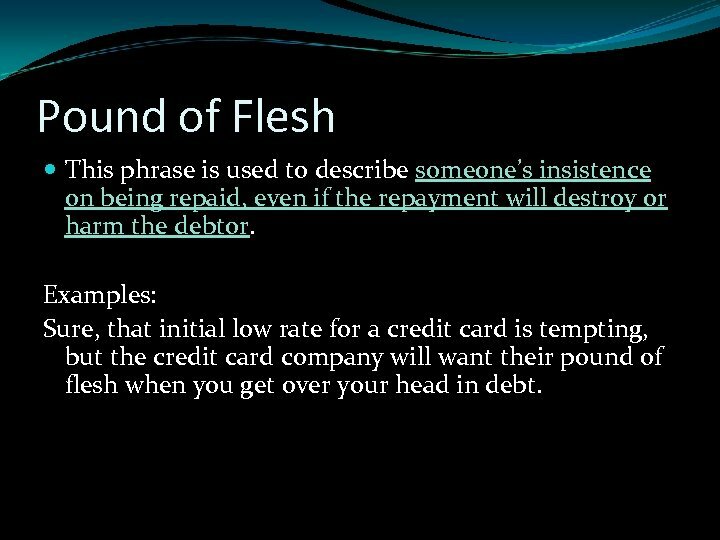 Pound of Flesh This phrase is used to describe someone’s insistence on being repaid, even if the repayment will destroy or harm the debtor. Examples: Sure, that initial low rate for a credit card is tempting, but the credit card company will want their pound of flesh when you get over your head in debt. 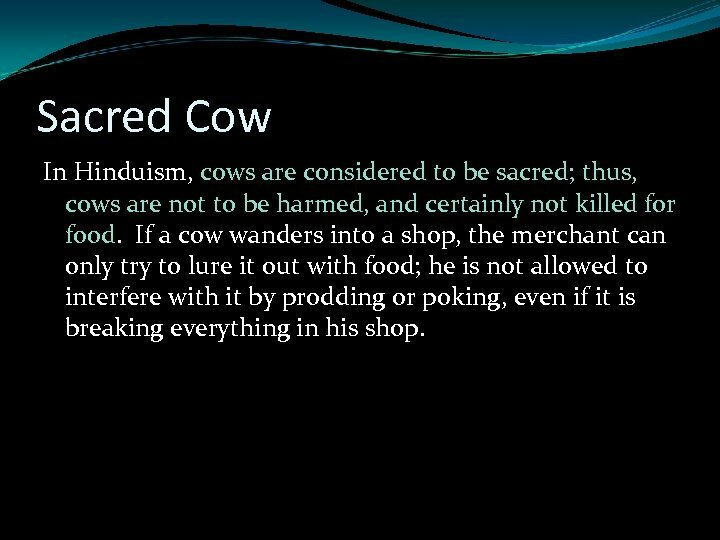 Sacred Cow In Hinduism, cows are considered to be sacred; thus, cows are not to be harmed, and certainly not killed for food. If a cow wanders into a shop, the merchant can only try to lure it out with food; he is not allowed to interfere with it by prodding or poking, even if it is breaking everything in his shop. 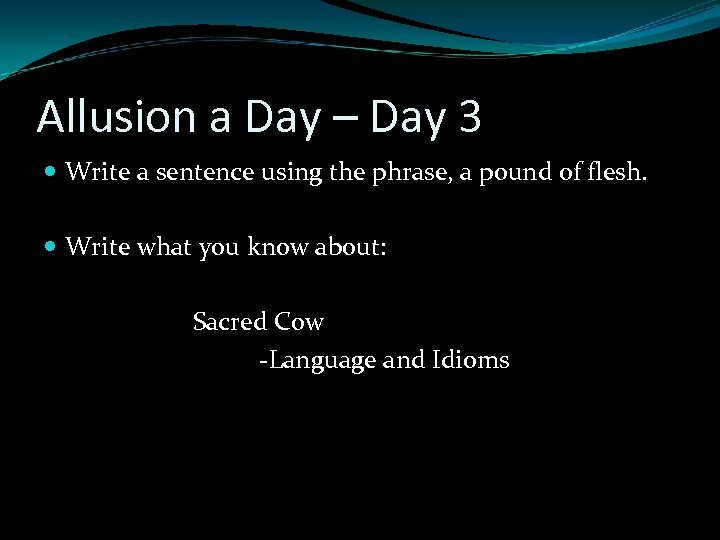 Sacred Cow The idiom “Sacred Cow” refers to something that cannot be interfered with or harmed in any way—even if not interfering could be seen as harmful in some way. 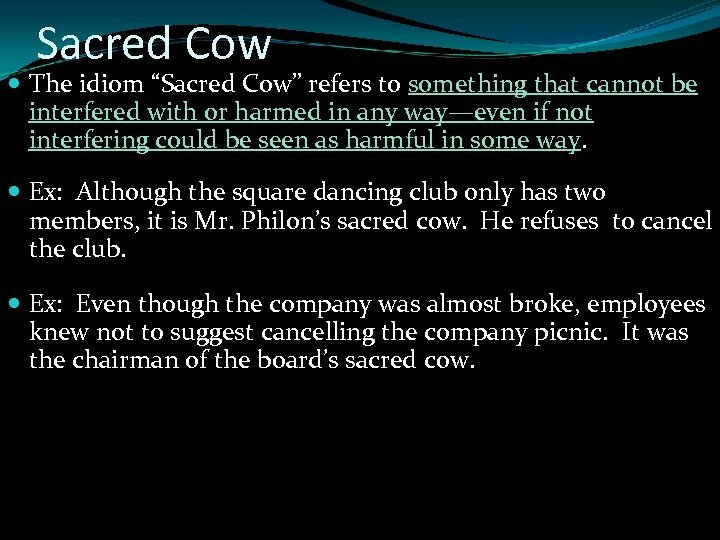 Ex: Although the square dancing club only has two members, it is Mr. Philon’s sacred cow. He refuses to cancel the club. Ex: Even though the company was almost broke, employees knew not to suggest cancelling the company picnic. It was the chairman of the board’s sacred cow. Crossing the Rubicon After defeating the Gauls in the Gallic Wars, Julius Caesar was ordered home by his enemies in the Senate, so he traveled south toward Italy. 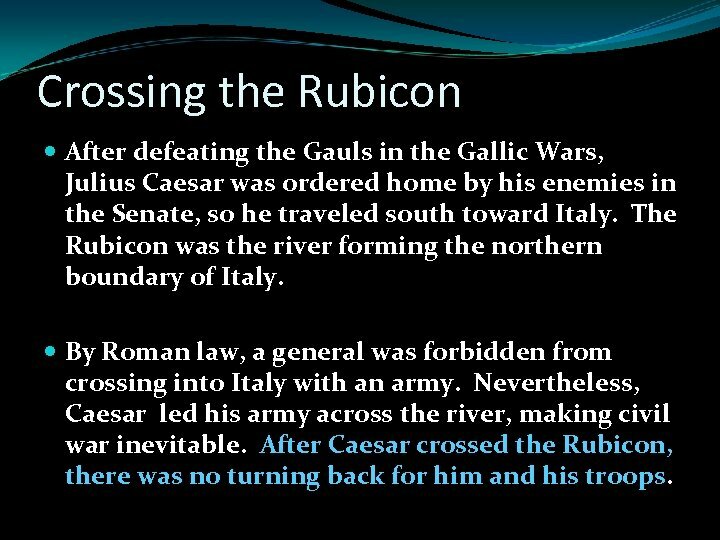 The Rubicon was the river forming the northern boundary of Italy. By Roman law, a general was forbidden from crossing into Italy with an army. 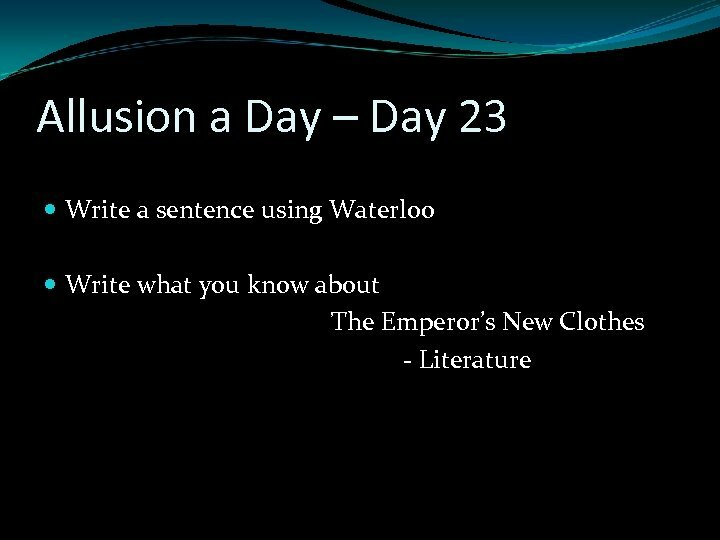 Nevertheless, Caesar led his army across the river, making civil war inevitable. After Caesar crossed the Rubicon, there was no turning back for him and his troops. 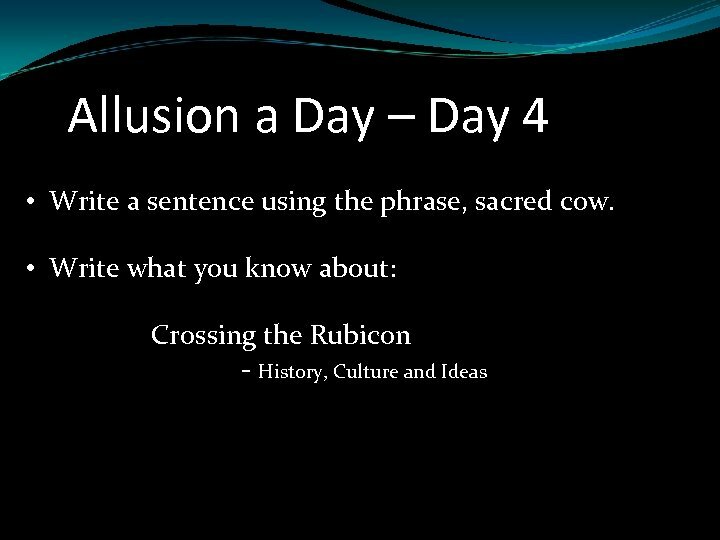 Crossing the Rubicon To cross the Rubicon is to take an irreversible step, often involving some danger. 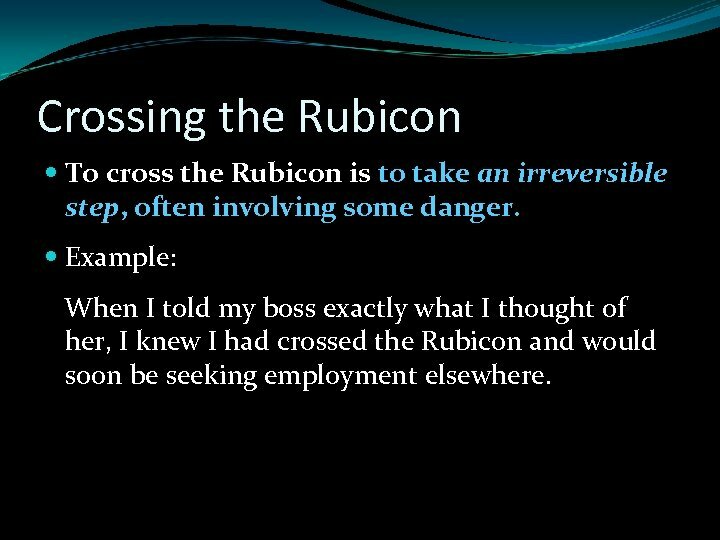 Example: When I told my boss exactly what I thought of her, I knew I had crossed the Rubicon and would soon be seeking employment elsewhere. 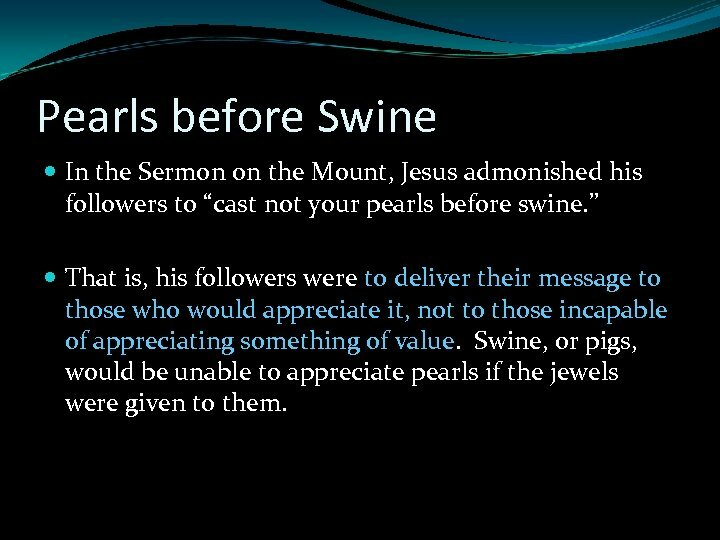 Pearls before Swine In the Sermon on the Mount, Jesus admonished his followers to “cast not your pearls before swine. ” That is, his followers were to deliver their message to those who would appreciate it, not to those incapable of appreciating something of value. 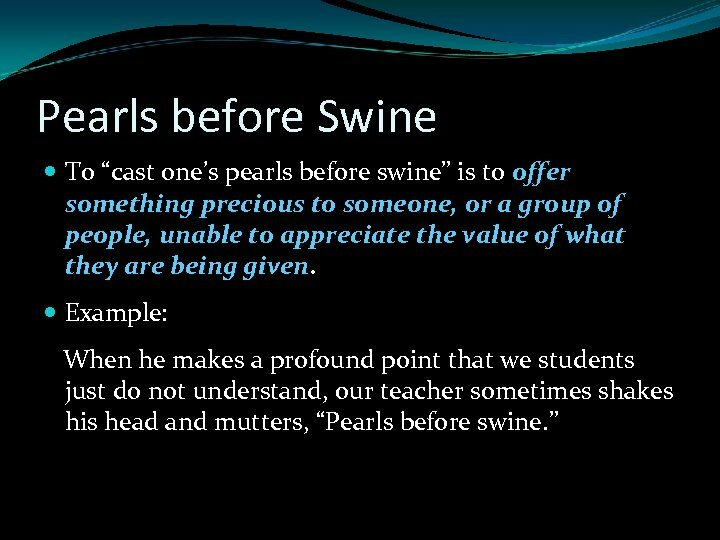 Swine, or pigs, would be unable to appreciate pearls if the jewels were given to them. Once in a Blue Moon A “blue moon” is a second full moon within the same calendar month, a phenomenon that occurs approximately every three years. 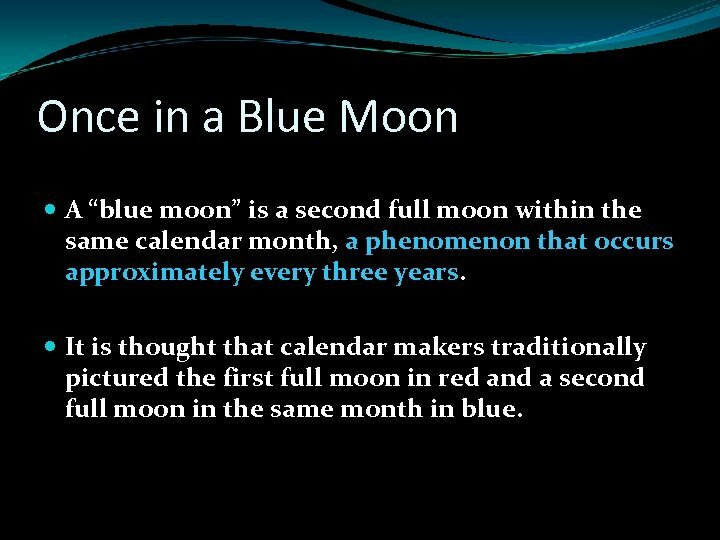 It is thought that calendar makers traditionally pictured the first full moon in red and a second full moon in the same month in blue. 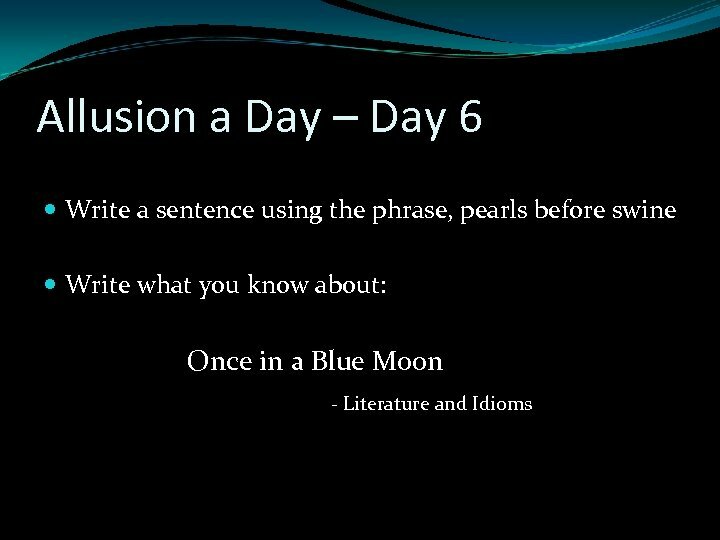 Once in a Blue Moon This phrase describes something that occurs very rarely. 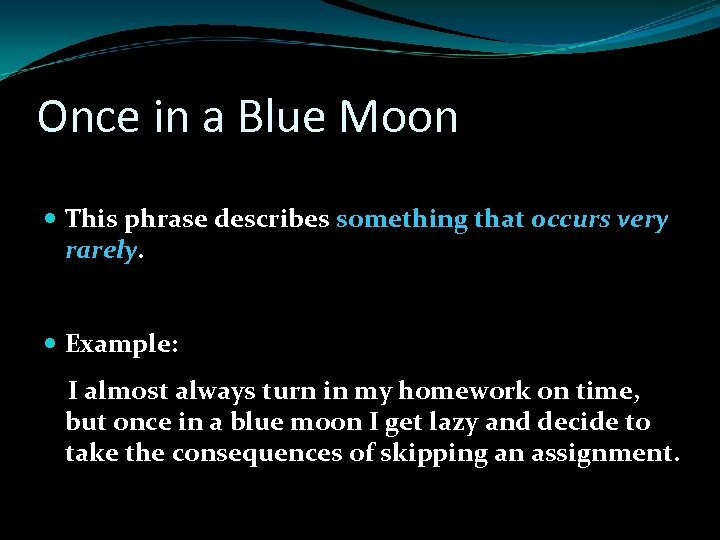 Example: I almost always turn in my homework on time, but once in a blue moon I get lazy and decide to take the consequences of skipping an assignment. 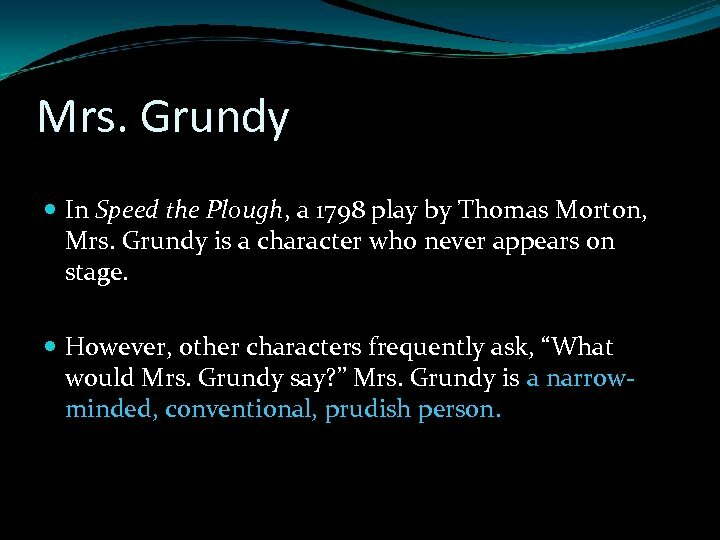 Mrs. Grundy In Speed the Plough, a 1798 play by Thomas Morton, Mrs. Grundy is a character who never appears on stage. However, other characters frequently ask, “What would Mrs. Grundy say? 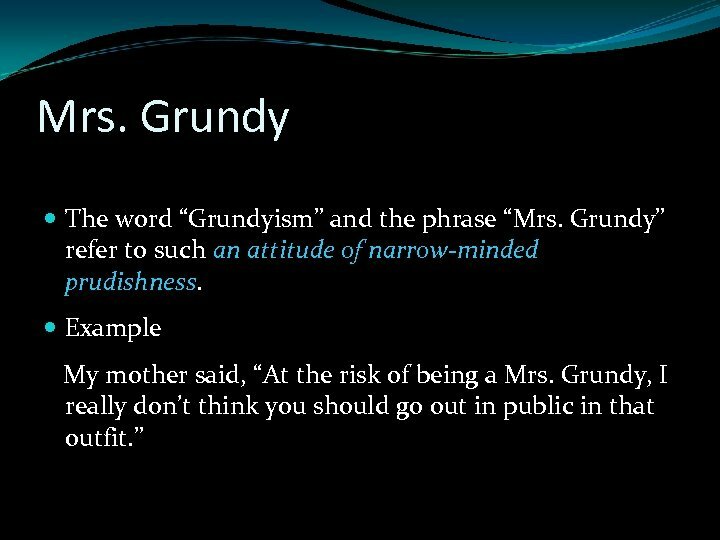 ” Mrs. Grundy is a narrowminded, conventional, prudish person. Crocodile Tears Crocodiles were once thought to shed large tears before devouring their prey. This belief, which dates to ancient times, comes from the fact that crocodiles have small ducts in the corner of their eyes which release “tears” when the crocodile opens its jaws wide. • Obviously, a cold-blooded reptile has no real feelings of sympathy for its prey. 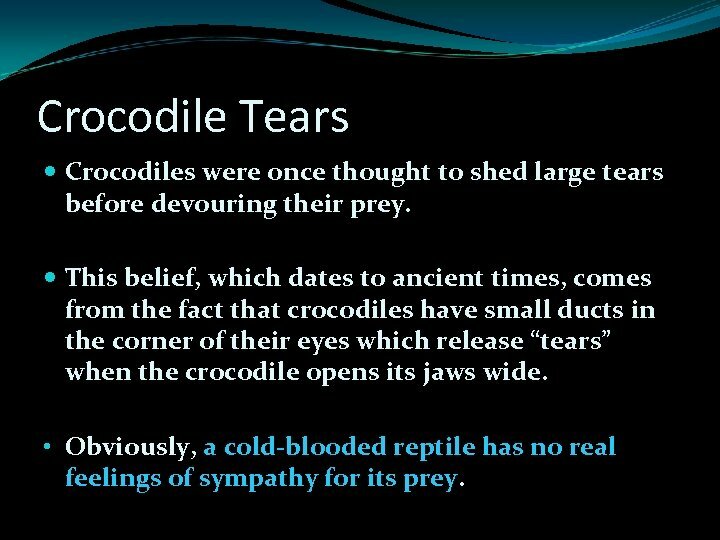 Crocodile Tears Thus, to shed crocodile tears is to show false sympathy for someone. 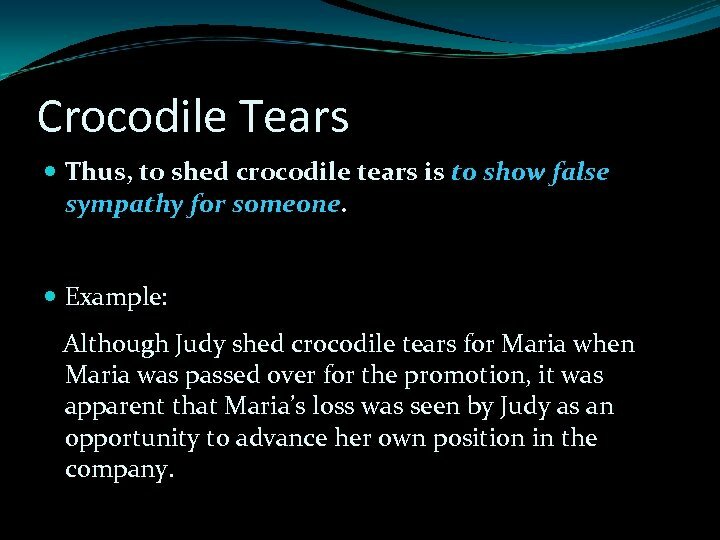 Example: Although Judy shed crocodile tears for Maria when Maria was passed over for the promotion, it was apparent that Maria’s loss was seen by Judy as an opportunity to advance her own position in the company. 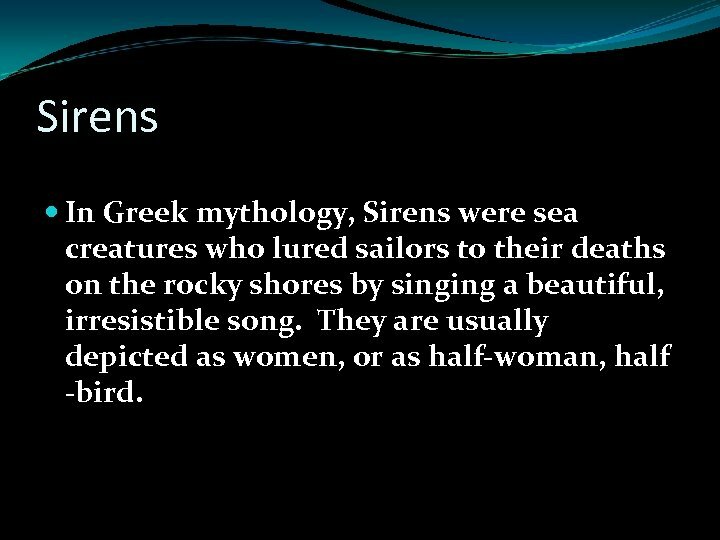 Sirens In Greek mythology, Sirens were sea creatures who lured sailors to their deaths on the rocky shores by singing a beautiful, irresistible song. They are usually depicted as women, or as half-woman, half -bird. 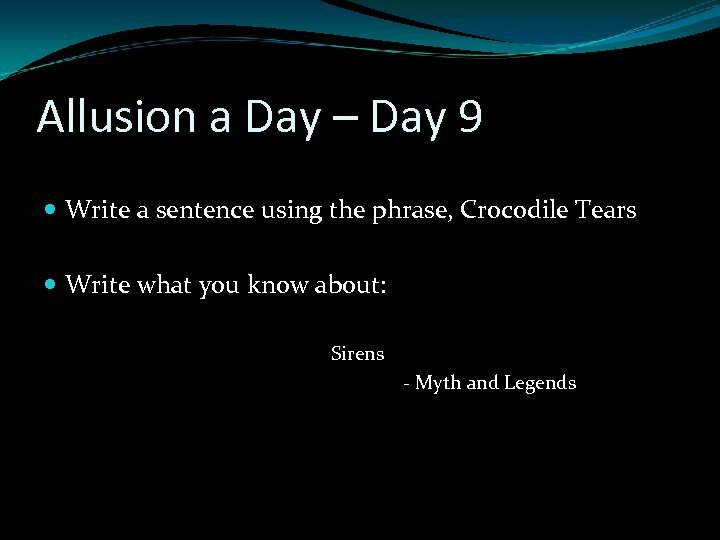 Sirens In modern usage, “sirens” can refer to anything that tempts a person away from safety and toward a destructive path. 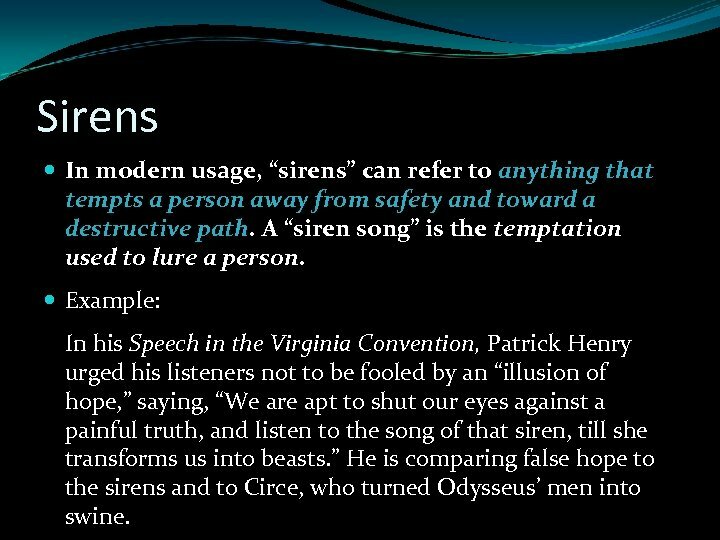 A “siren song” is the temptation used to lure a person. 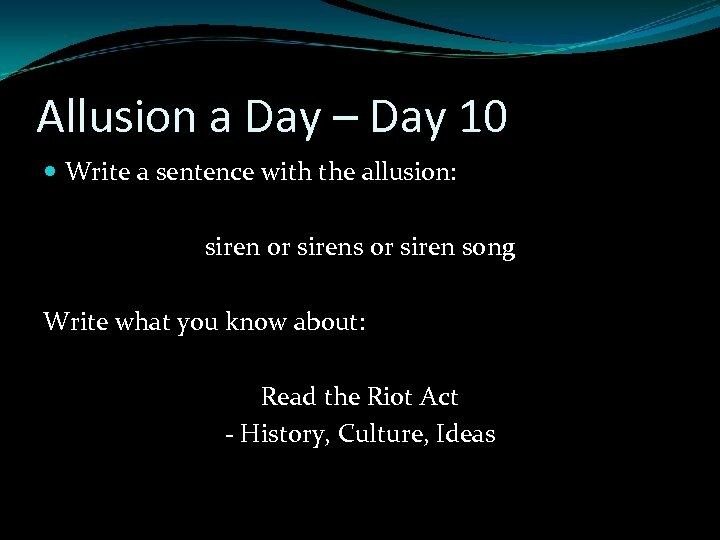 Example: In his Speech in the Virginia Convention, Patrick Henry urged his listeners not to be fooled by an “illusion of hope, ” saying, “We are apt to shut our eyes against a painful truth, and listen to the song of that siren, till she transforms us into beasts. ” He is comparing false hope to the sirens and to Circe, who turned Odysseus’ men into swine. 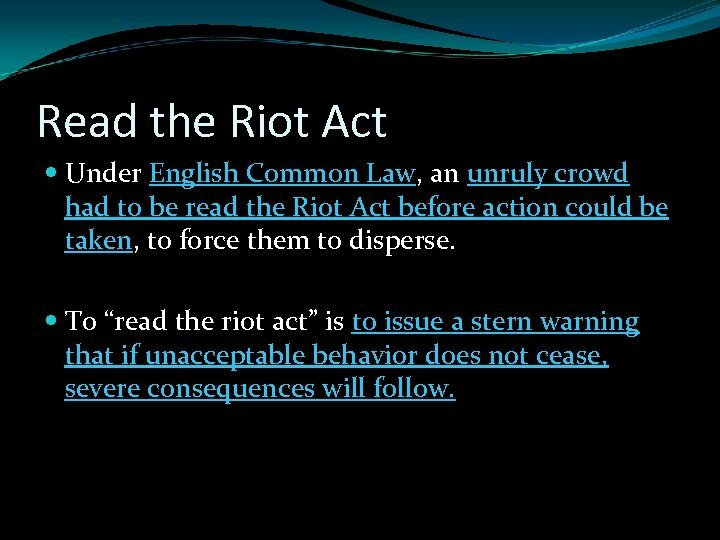 Read the Riot Act Under English Common Law, an unruly crowd had to be read the Riot Act before action could be taken, to force them to disperse. To “read the riot act” is to issue a stern warning that if unacceptable behavior does not cease, severe consequences will follow. 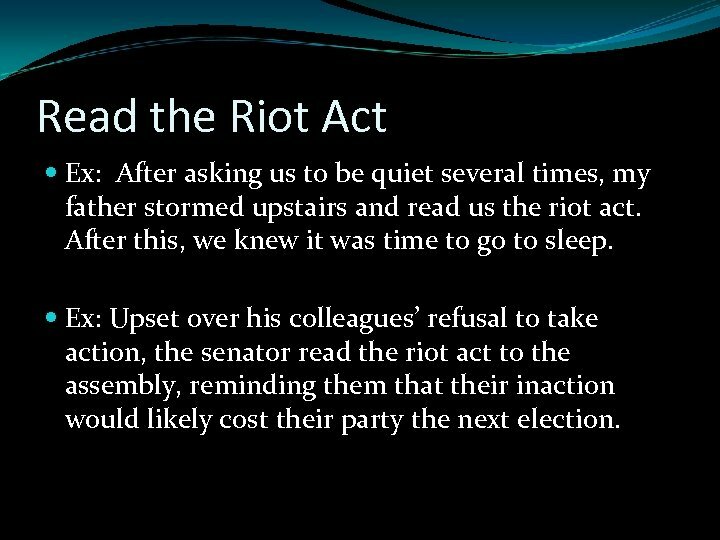 Read the Riot Act Ex: After asking us to be quiet several times, my father stormed upstairs and read us the riot act. After this, we knew it was time to go to sleep. Ex: Upset over his colleagues’ refusal to take action, the senator read the riot act to the assembly, reminding them that their inaction would likely cost their party the next election. 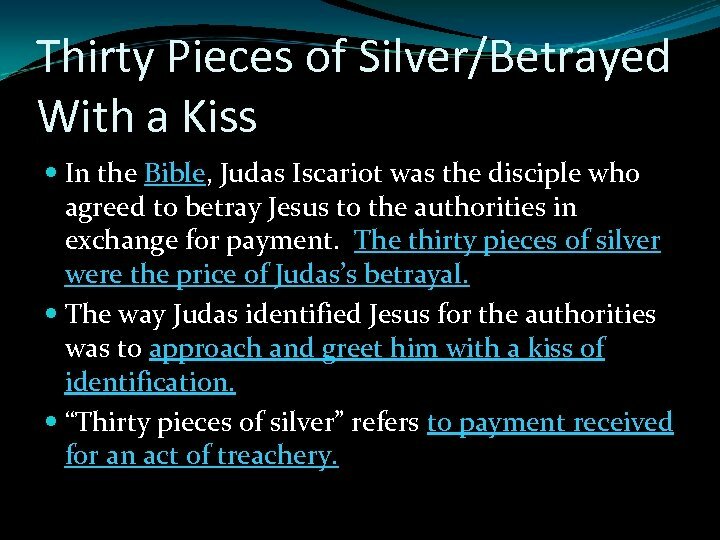 Thirty Pieces of Silver/Betrayed With a Kiss In the Bible, Judas Iscariot was the disciple who agreed to betray Jesus to the authorities in exchange for payment. The thirty pieces of silver were the price of Judas’s betrayal. 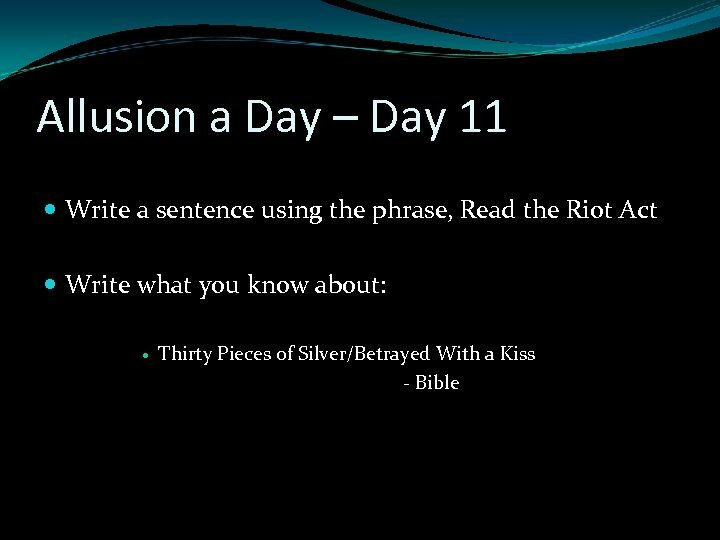 The way Judas identified Jesus for the authorities was to approach and greet him with a kiss of identification. “Thirty pieces of silver” refers to payment received for an act of treachery. 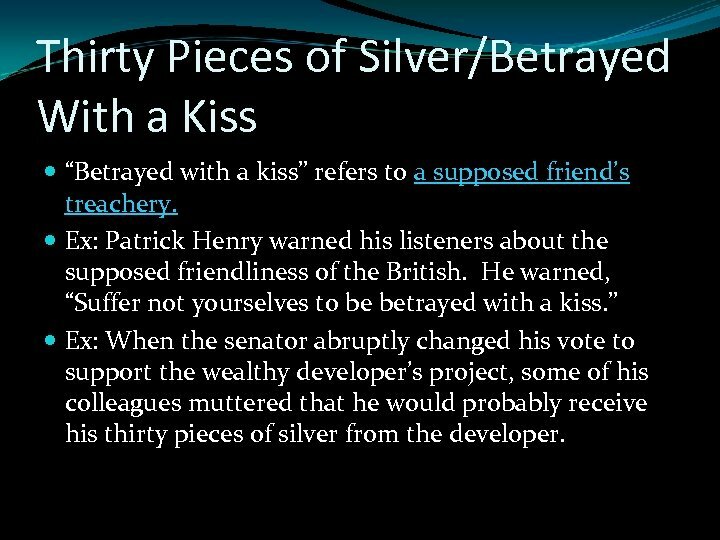 Thirty Pieces of Silver/Betrayed With a Kiss “Betrayed with a kiss” refers to a supposed friend’s treachery. Ex: Patrick Henry warned his listeners about the supposed friendliness of the British. He warned, “Suffer not yourselves to be betrayed with a kiss. ” Ex: When the senator abruptly changed his vote to support the wealthy developer’s project, some of his colleagues muttered that he would probably receive his thirty pieces of silver from the developer. 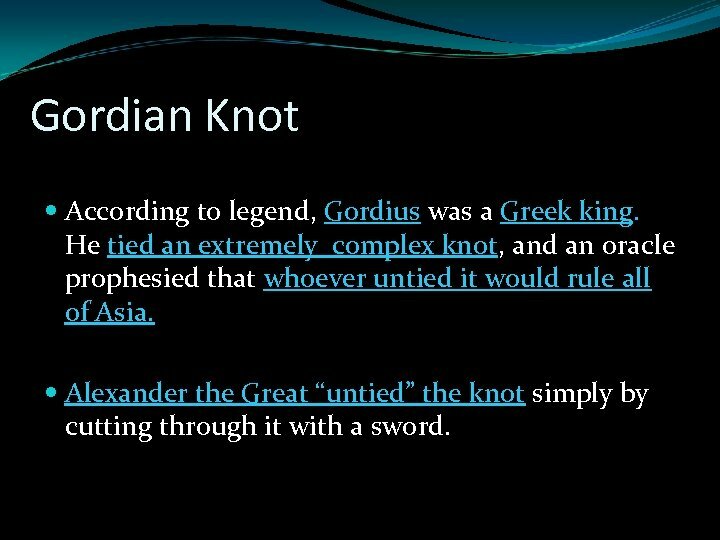 Gordian Knot According to legend, Gordius was a Greek king. He tied an extremely complex knot, and an oracle prophesied that whoever untied it would rule all of Asia. Alexander the Great “untied” the knot simply by cutting through it with a sword. 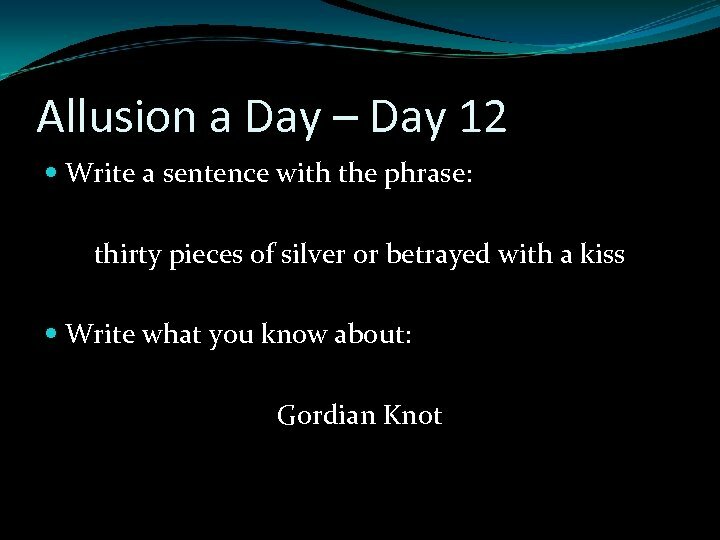 Gordian Knot A “Gordian Knot” is any extremely complex problem, and “cutting the Gordian Knot” refers to solving such a problem in a quick decisive manner. 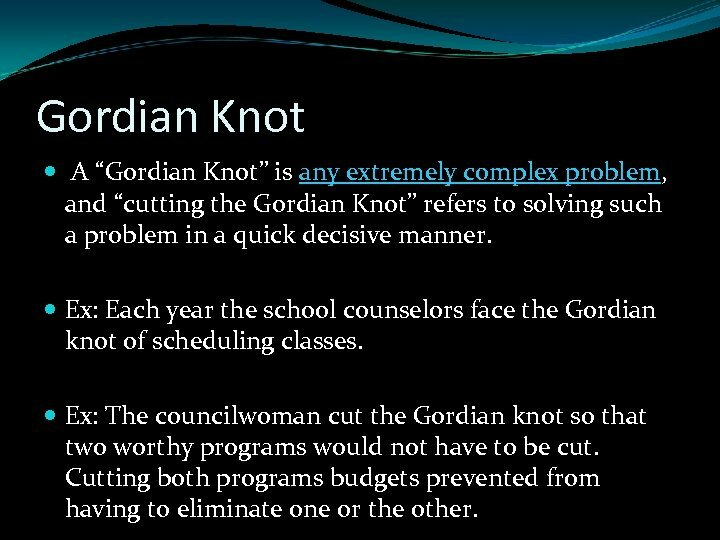 Ex: Each year the school counselors face the Gordian knot of scheduling classes. Ex: The councilwoman cut the Gordian knot so that two worthy programs would not have to be cut. Cutting both programs budgets prevented from having to eliminate one or the other. 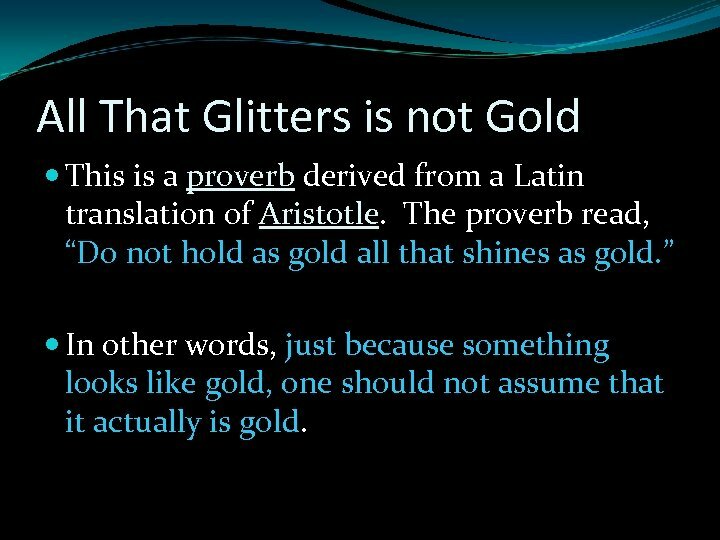 All That Glitters is not Gold This is a proverb derived from a Latin translation of Aristotle. 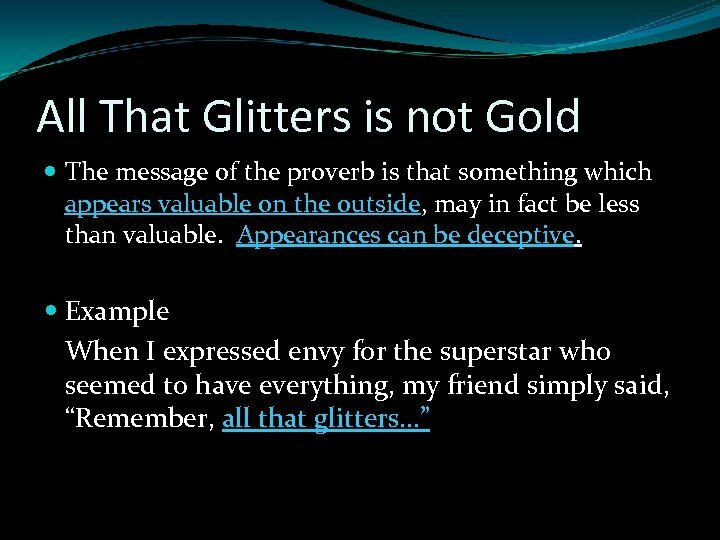 The proverb read, “Do not hold as gold all that shines as gold. 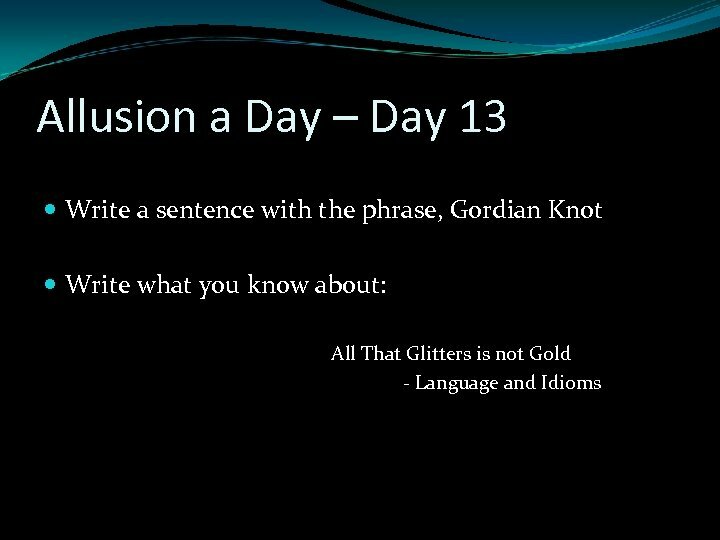 ” In other words, just because something looks like gold, one should not assume that it actually is gold. 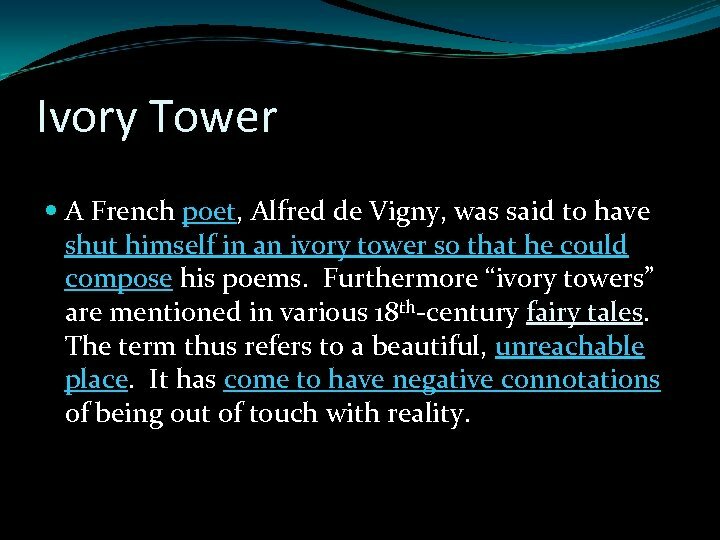 Ivory Tower A French poet, Alfred de Vigny, was said to have shut himself in an ivory tower so that he could compose his poems. 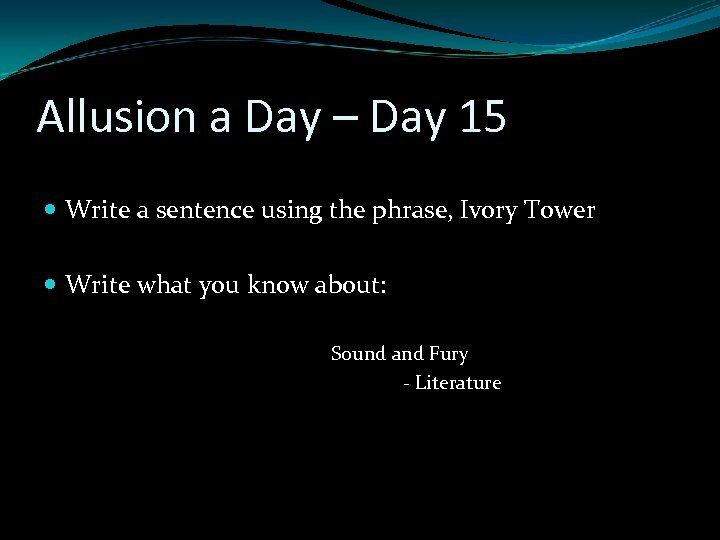 Furthermore “ivory towers” are mentioned in various 18 th-century fairy tales. The term thus refers to a beautiful, unreachable place. It has come to have negative connotations of being out of touch with reality. 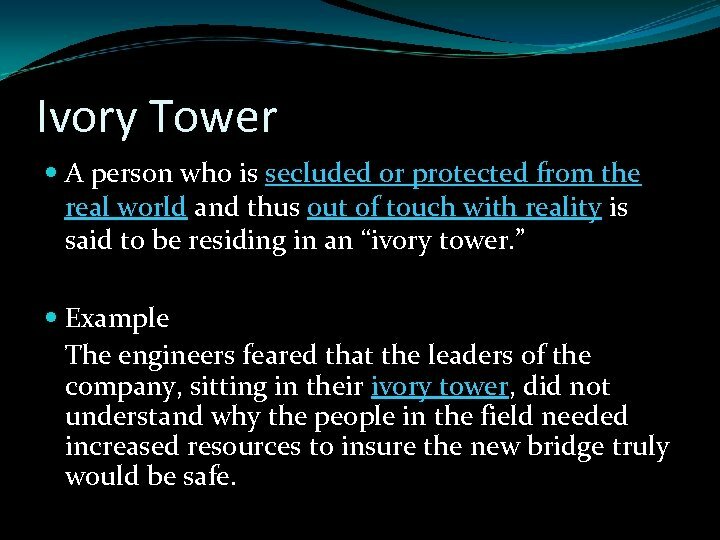 Ivory Tower A person who is secluded or protected from the real world and thus out of touch with reality is said to be residing in an “ivory tower. ” Example The engineers feared that the leaders of the company, sitting in their ivory tower, did not understand why the people in the field needed increased resources to insure the new bridge truly would be safe. 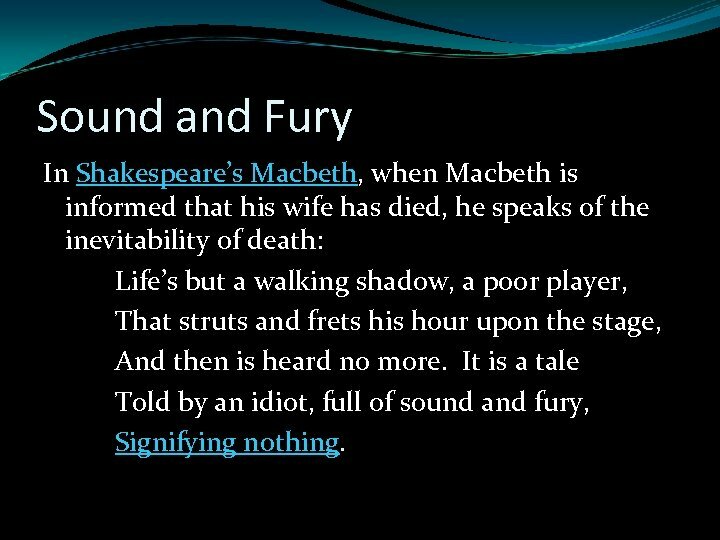 Sound and Fury In Shakespeare’s Macbeth, when Macbeth is informed that his wife has died, he speaks of the inevitability of death: Life’s but a walking shadow, a poor player, That struts and frets his hour upon the stage, And then is heard no more. It is a tale Told by an idiot, full of sound and fury, Signifying nothing. 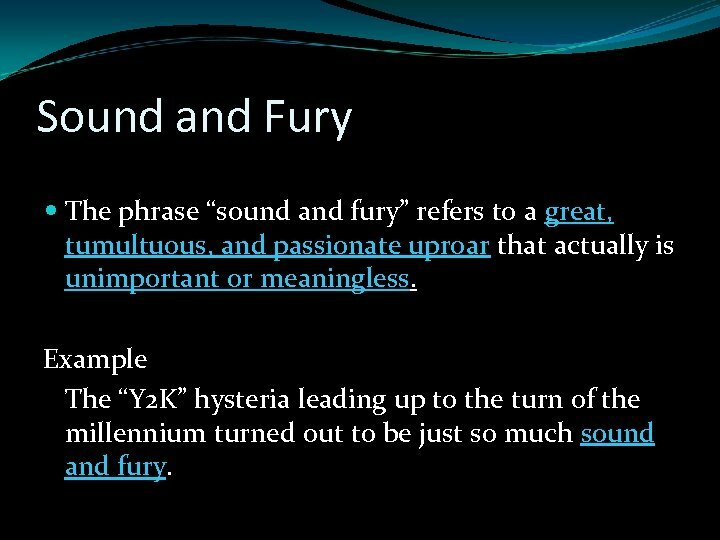 Sound and Fury The phrase “sound and fury” refers to a great, tumultuous, and passionate uproar that actually is unimportant or meaningless. Example The “Y 2 K” hysteria leading up to the turn of the millennium turned out to be just so much sound and fury. 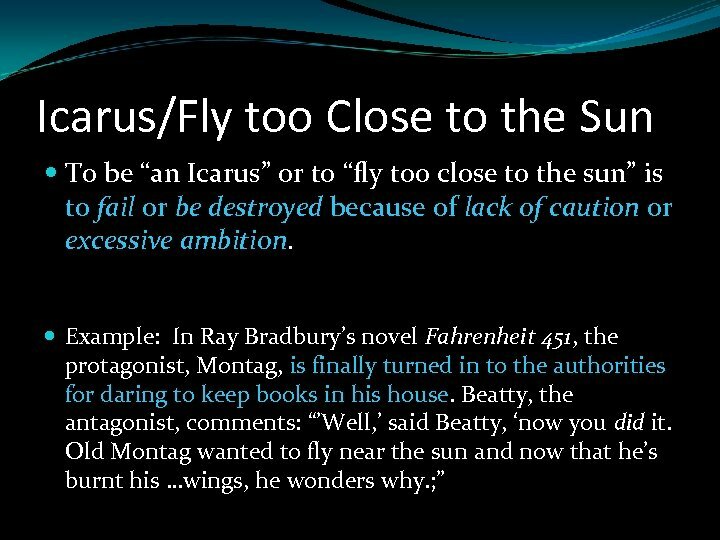 Icarus/Fly too Close to the Sun In Greek mythology, Icarus and his father, Daedalus, escaped from the island of Crete by means of wings constructed by Daedalus. 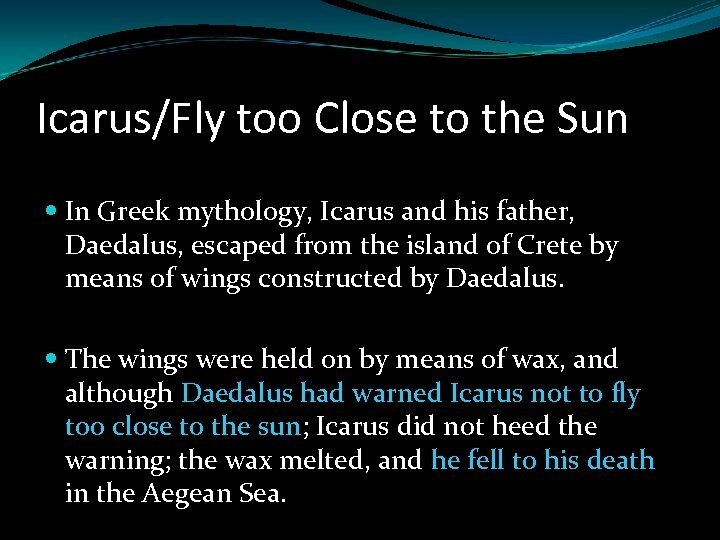 The wings were held on by means of wax, and although Daedalus had warned Icarus not to fly too close to the sun; Icarus did not heed the warning; the wax melted, and he fell to his death in the Aegean Sea. Bread and Circuses This phrase was used by a writer during the time of the Roman Empire. 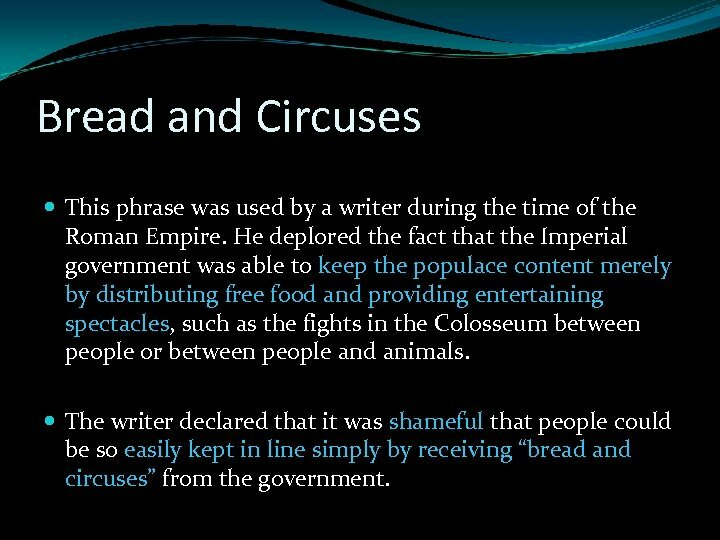 He deplored the fact that the Imperial government was able to keep the populace content merely by distributing free food and providing entertaining spectacles, such as the fights in the Colosseum between people or between people and animals. The writer declared that it was shameful that people could be so easily kept in line simply by receiving “bread and circuses” from the government. 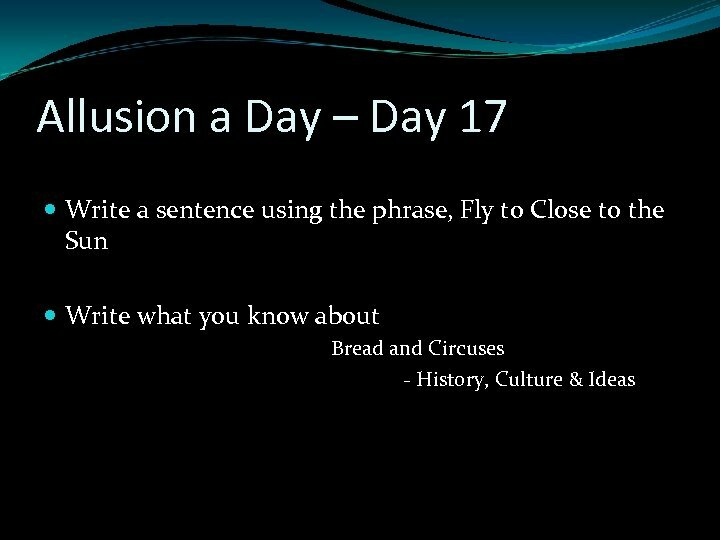 Bread and Circuses This term refers to policies designed to prevent unrest by keeping people happy and thus deflecting concern about troubling issues. 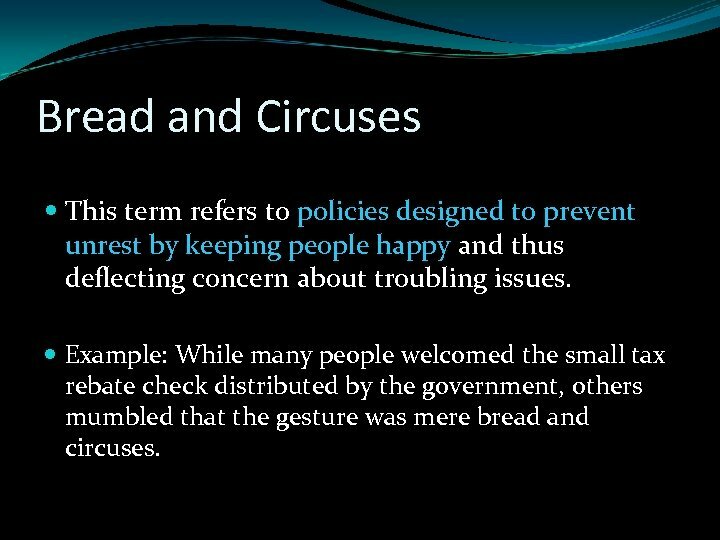 Example: While many people welcomed the small tax rebate check distributed by the government, others mumbled that the gesture was mere bread and circuses. 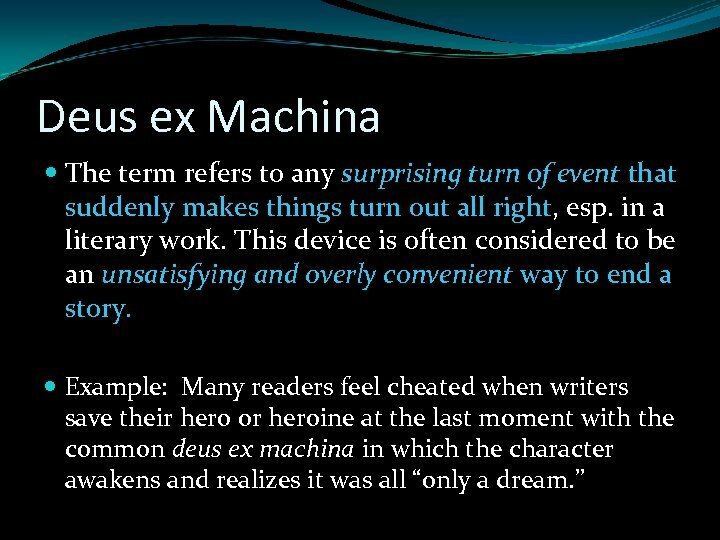 Deus ex Machina This phrase literally means “god from the mechane”. In classical theater, the machane was a crane with a harness for an actor. The actor could thus be lowered from the ceiling and appear to be flying. 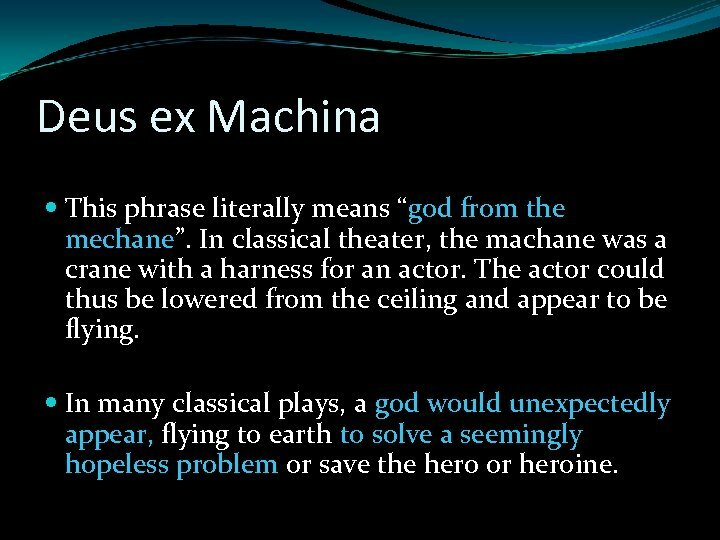 In many classical plays, a god would unexpectedly appear, flying to earth to solve a seemingly hopeless problem or save the hero or heroine. 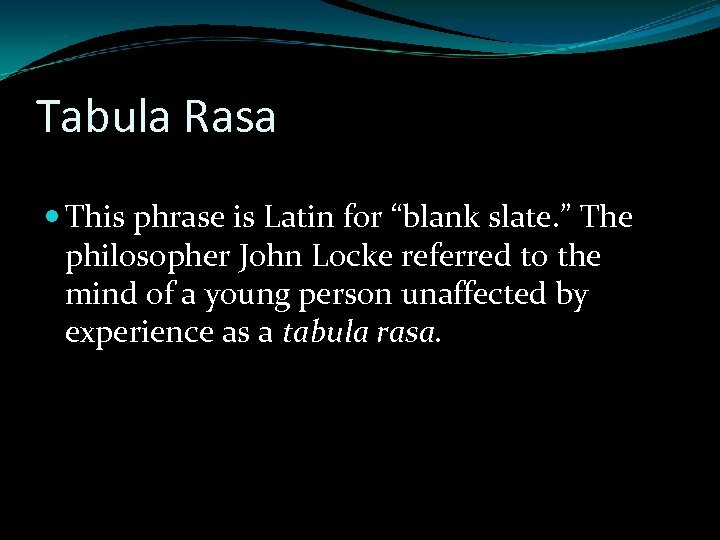 Tabula Rasa This phrase is Latin for “blank slate. 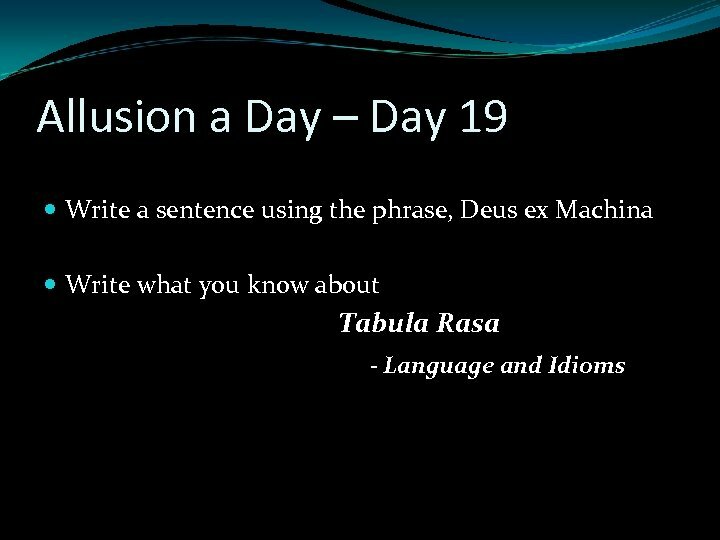 ” The philosopher John Locke referred to the mind of a young person unaffected by experience as a tabula rasa. 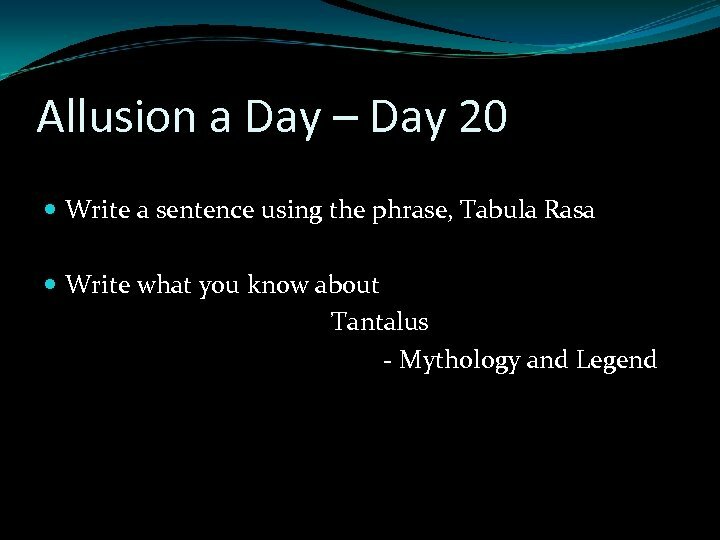 Tabula Rasa The phrase refers to the idea that something or someone is entirely unmarked and uninfluenced. 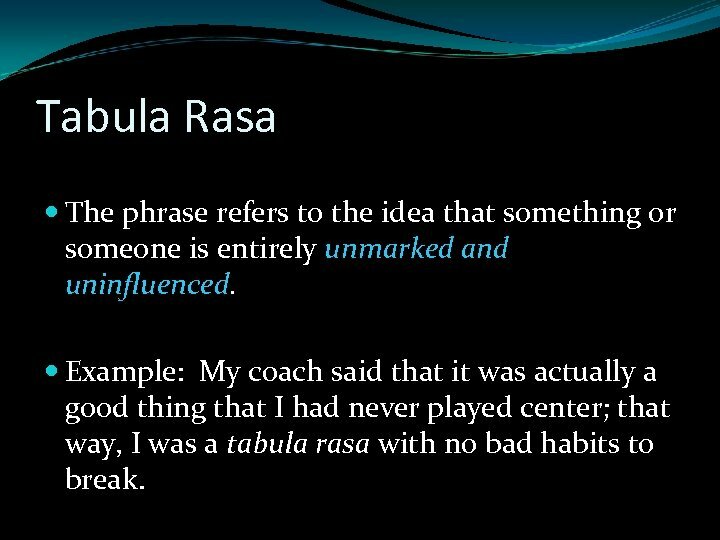 Example: My coach said that it was actually a good thing that I had never played center; that way, I was a tabula rasa with no bad habits to break. 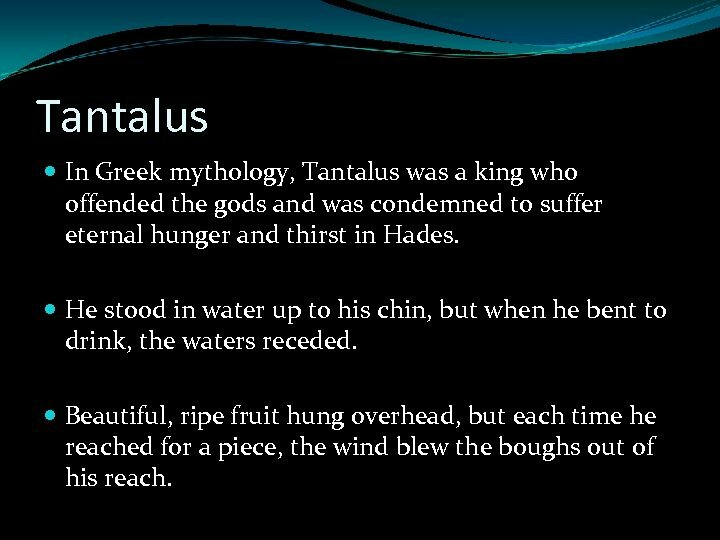 Tantalus In Greek mythology, Tantalus was a king who offended the gods and was condemned to suffer eternal hunger and thirst in Hades. He stood in water up to his chin, but when he bent to drink, the waters receded. Beautiful, ripe fruit hung overhead, but each time he reached for a piece, the wind blew the boughs out of his reach. 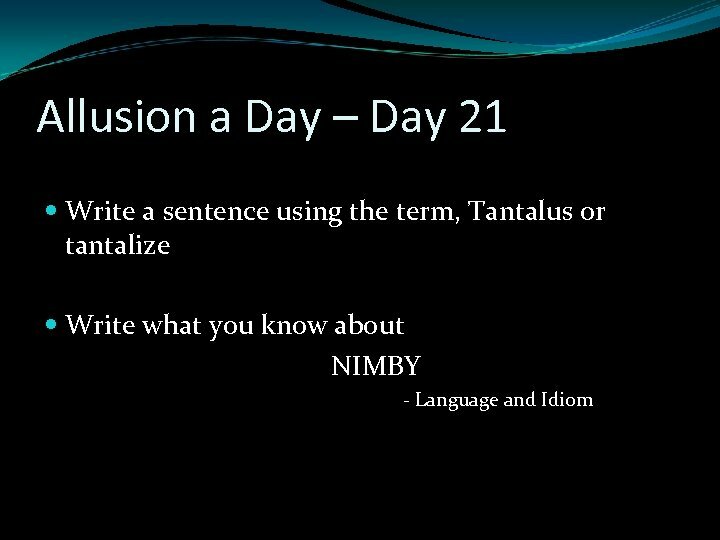 Tantalus To be “tantalized” or to be like Tantalus, is to be offered something desirable which is then withheld. 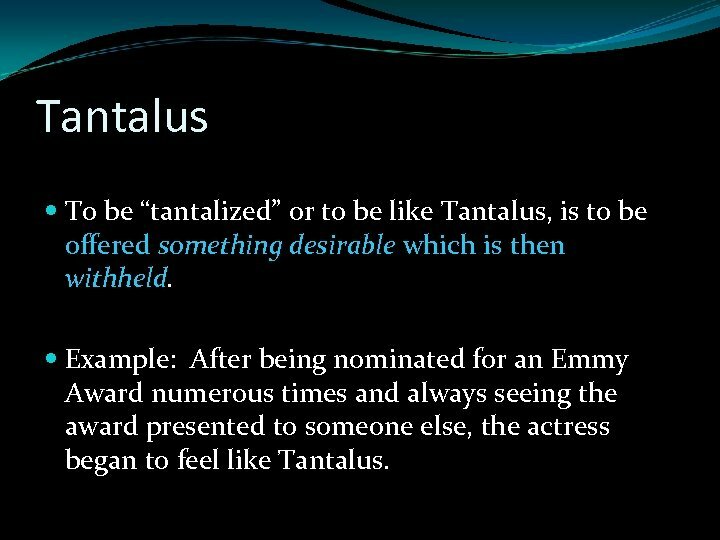 Example: After being nominated for an Emmy Award numerous times and always seeing the award presented to someone else, the actress began to feel like Tantalus. 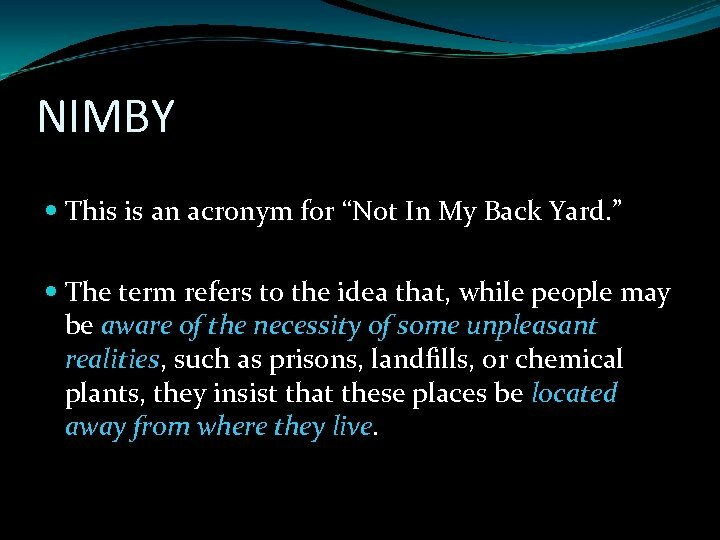 NIMBY This is an acronym for “Not In My Back Yard. ” The term refers to the idea that, while people may be aware of the necessity of some unpleasant realities, such as prisons, landfills, or chemical plants, they insist that these places be located away from where they live. 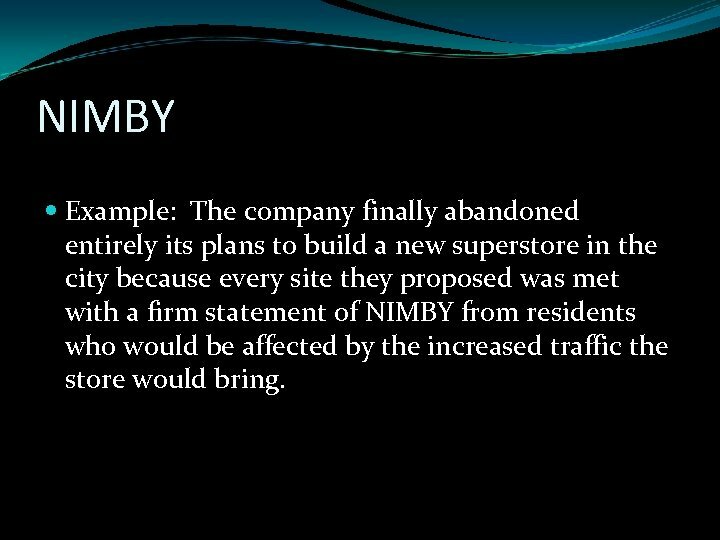 NIMBY Example: The company finally abandoned entirely its plans to build a new superstore in the city because every site they proposed was met with a firm statement of NIMBY from residents who would be affected by the increased traffic the store would bring. 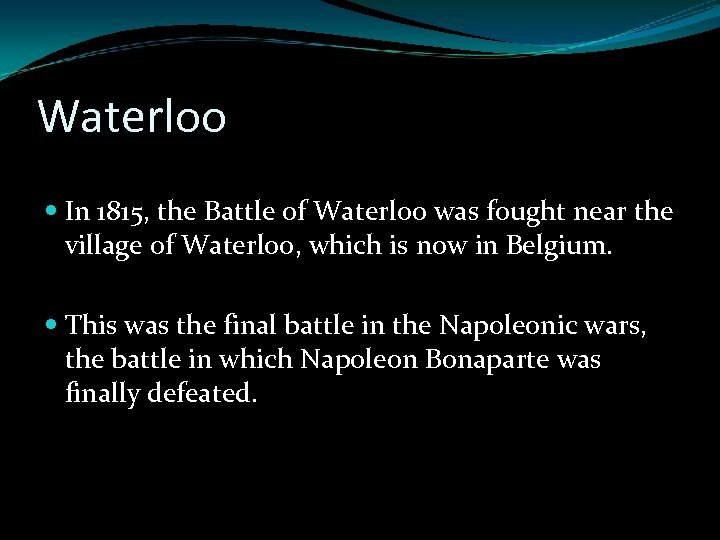 Waterloo In 1815, the Battle of Waterloo was fought near the village of Waterloo, which is now in Belgium. This was the final battle in the Napoleonic wars, the battle in which Napoleon Bonaparte was finally defeated. 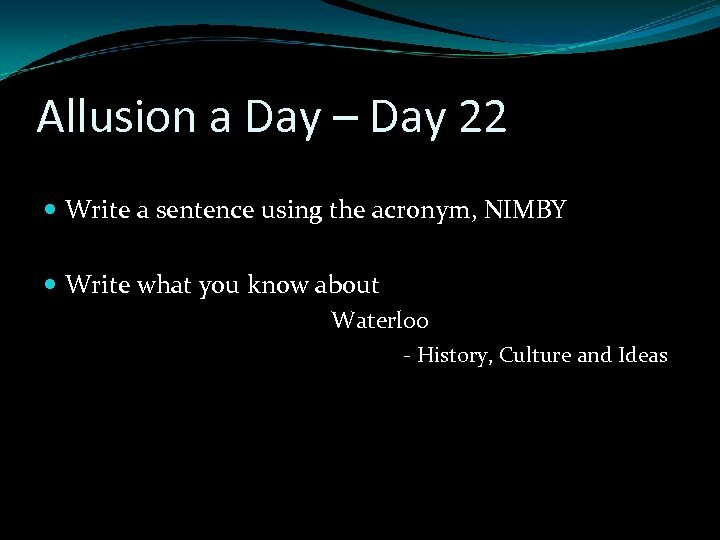 Waterloo To meet one’s Waterloo is to suffer an ultimate, decisive defeat. 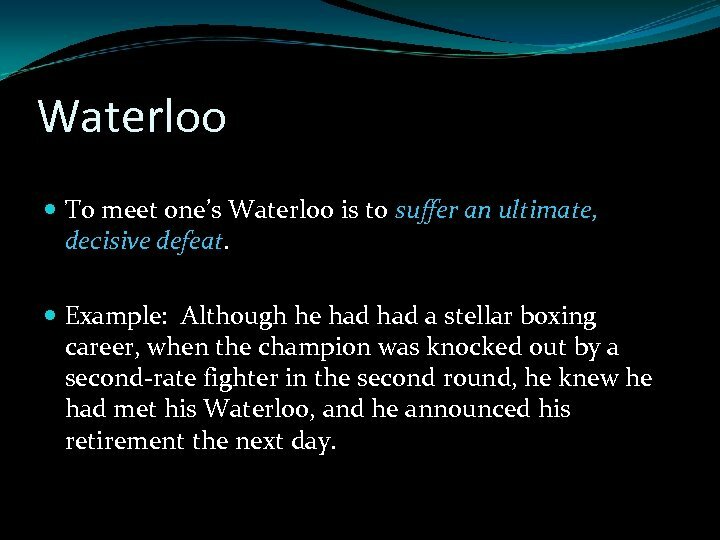 Example: Although he had a stellar boxing career, when the champion was knocked out by a second-rate fighter in the second round, he knew he had met his Waterloo, and he announced his retirement the next day. 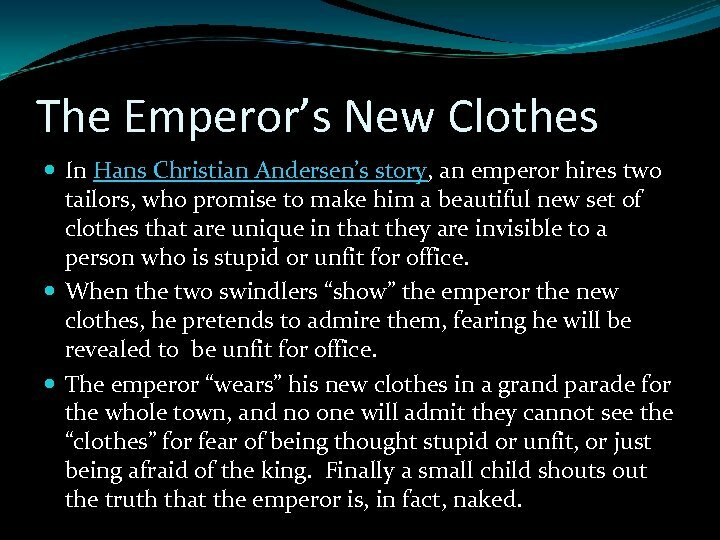 The Emperor’s New Clothes In Hans Christian Andersen’s story, an emperor hires two tailors, who promise to make him a beautiful new set of clothes that are unique in that they are invisible to a person who is stupid or unfit for office. When the two swindlers “show” the emperor the new clothes, he pretends to admire them, fearing he will be revealed to be unfit for office. The emperor “wears” his new clothes in a grand parade for the whole town, and no one will admit they cannot see the “clothes” for fear of being thought stupid or unfit, or just being afraid of the king. Finally a small child shouts out the truth that the emperor is, in fact, naked. 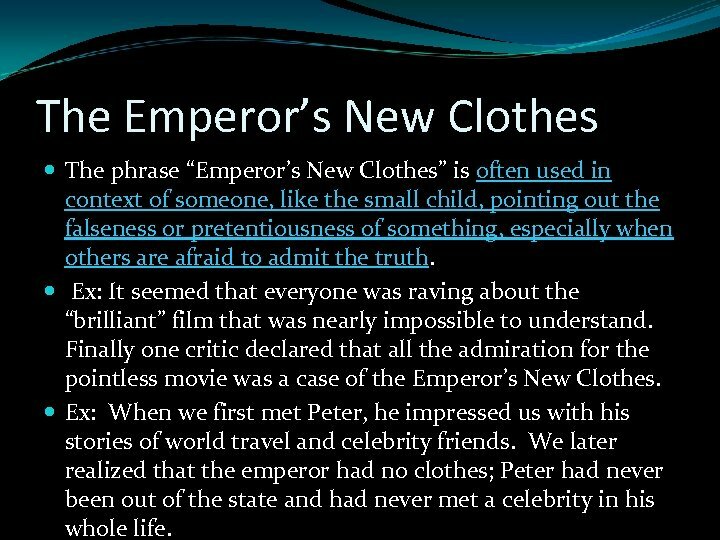 The Emperor’s New Clothes The phrase “Emperor’s New Clothes” is often used in context of someone, like the small child, pointing out the falseness or pretentiousness of something, especially when others are afraid to admit the truth. Ex: It seemed that everyone was raving about the “brilliant” film that was nearly impossible to understand. Finally one critic declared that all the admiration for the pointless movie was a case of the Emperor’s New Clothes. Ex: When we first met Peter, he impressed us with his stories of world travel and celebrity friends. We later realized that the emperor had no clothes; Peter had never been out of the state and had never met a celebrity in his whole life. 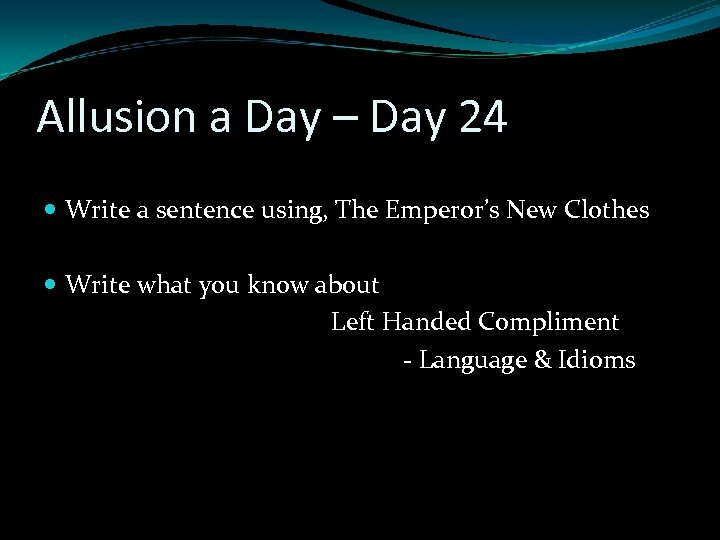 Left Handed Compliment In language, the left hand is often associated with something negative. 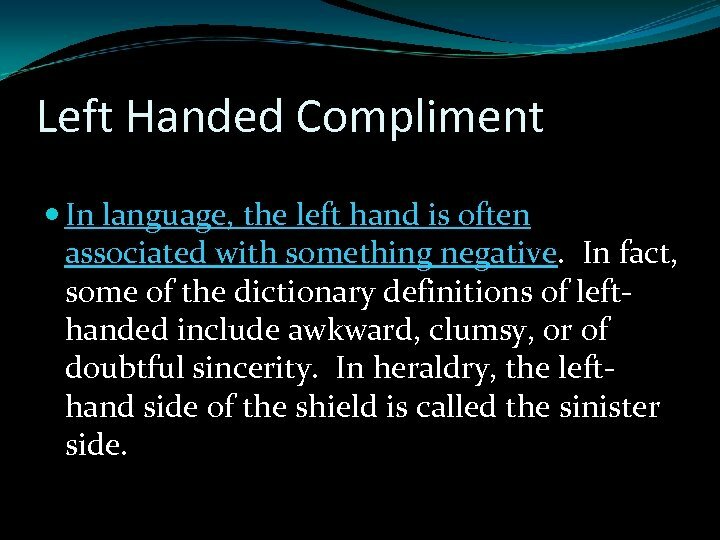 In fact, some of the dictionary definitions of lefthanded include awkward, clumsy, or of doubtful sincerity. In heraldry, the lefthand side of the shield is called the sinister side. 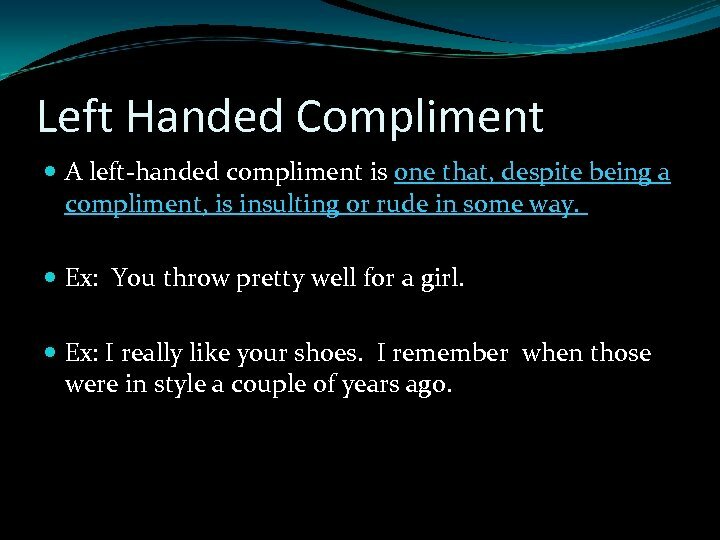 Left Handed Compliment A left-handed compliment is one that, despite being a compliment, is insulting or rude in some way. Ex: You throw pretty well for a girl. Ex: I really like your shoes. I remember when those were in style a couple of years ago. Golden Calf In the book of Exodus, Moses is leading his people out of Egypt to the Promised Land. While Moses is up on Mt. 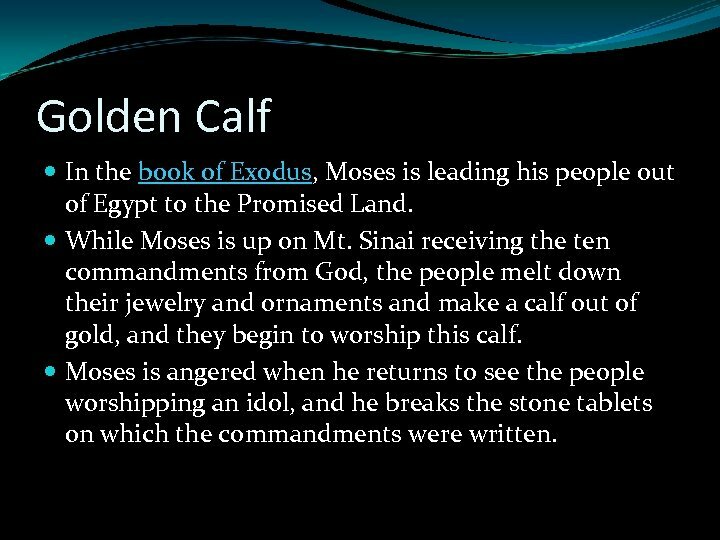 Sinai receiving the ten commandments from God, the people melt down their jewelry and ornaments and make a calf out of gold, and they begin to worship this calf. Moses is angered when he returns to see the people worshipping an idol, and he breaks the stone tablets on which the commandments were written. 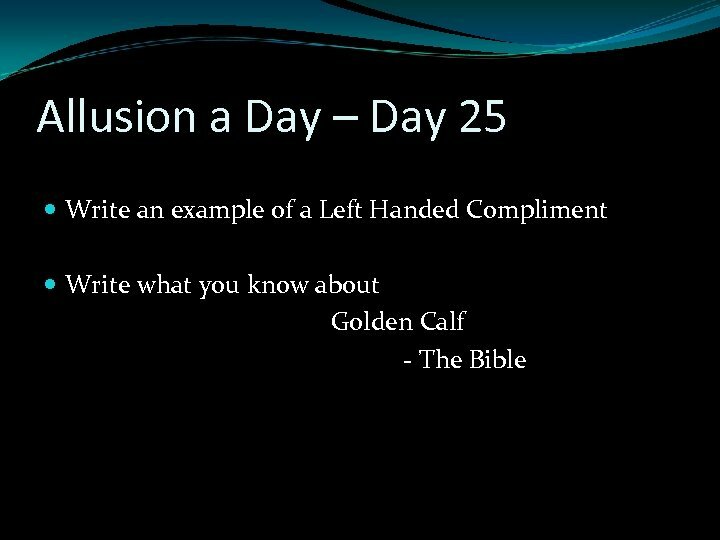 Golden Calf A “golden calf” is an idol or any object, especially a material object, that is worshipped even though it is not worthy of worship. Ex: In their relentless pursuit of their idea of “success”, people who worship the golden calf of financial wealth often miss out on the pleasure of spending time with friends and family. 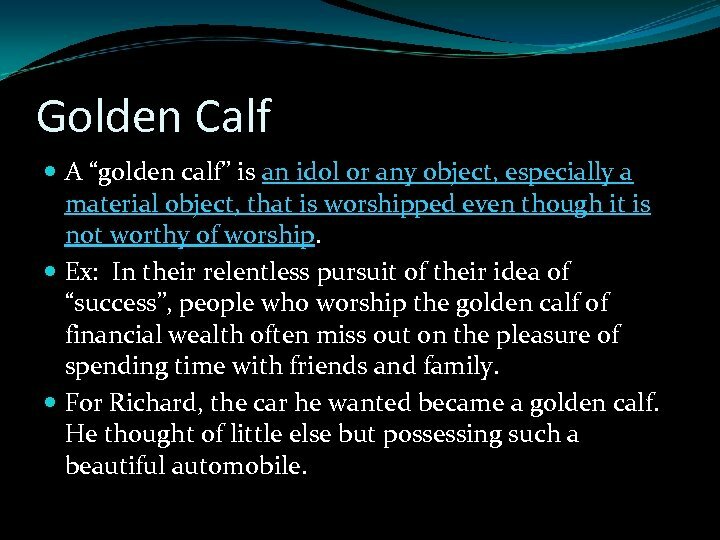 For Richard, the car he wanted became a golden calf. He thought of little else but possessing such a beautiful automobile. 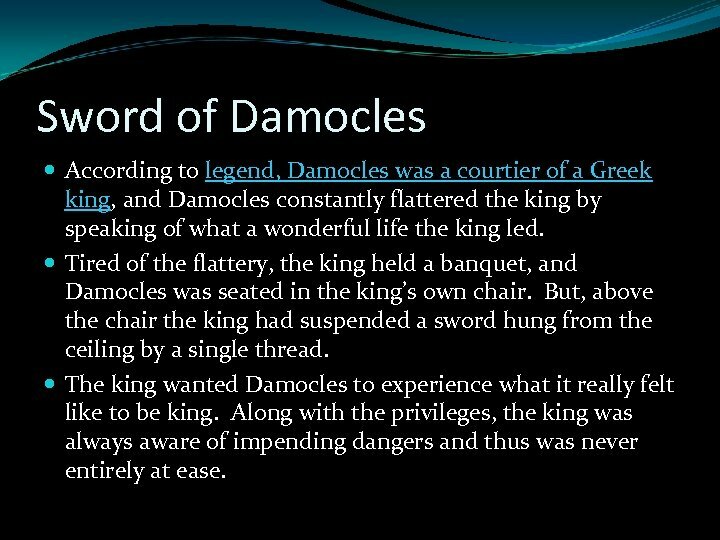 Sword of Damocles According to legend, Damocles was a courtier of a Greek king, and Damocles constantly flattered the king by speaking of what a wonderful life the king led. Tired of the flattery, the king held a banquet, and Damocles was seated in the king’s own chair. But, above the chair the king had suspended a sword hung from the ceiling by a single thread. The king wanted Damocles to experience what it really felt like to be king. Along with the privileges, the king was always aware of impending dangers and thus was never entirely at ease. Sword of Damocles The phrase “sword of Damocles” refers to an awareness of impending or imminent danger. EX: Although Sandy enjoyed her job at the factory, she and her co-workers knew that the sword of Damocles could fall at any minute and they could be laid off because of budget problems. 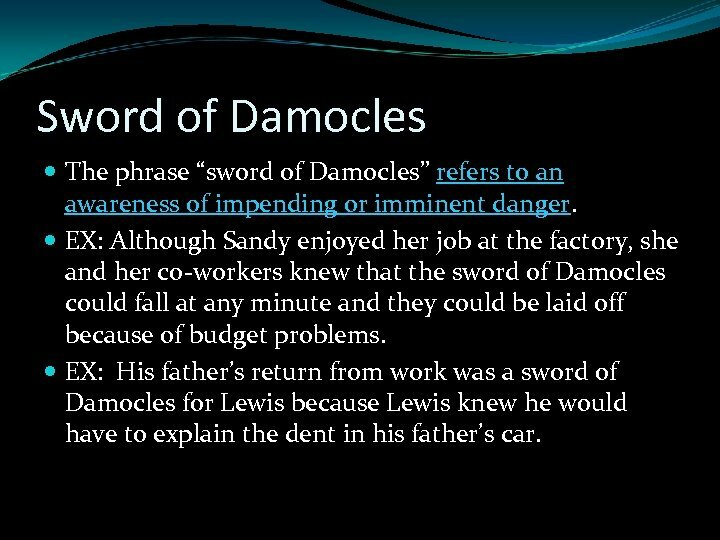 EX: His father’s return from work was a sword of Damocles for Lewis because Lewis knew he would have to explain the dent in his father’s car. 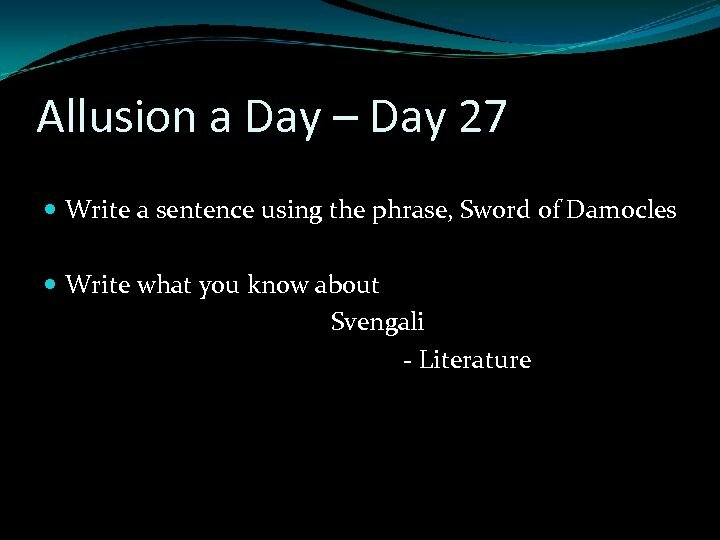 Svengali is the name of a character in Trilby, a novel by George du Maurier. 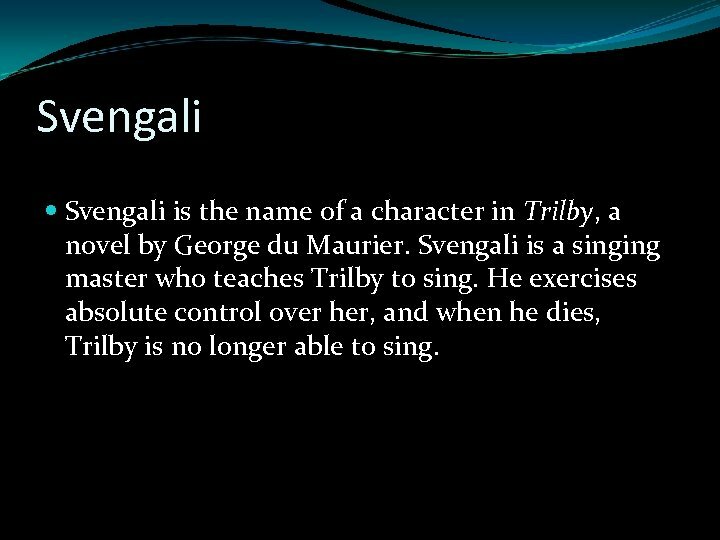 Svengali is a singing master who teaches Trilby to sing. He exercises absolute control over her, and when he dies, Trilby is no longer able to sing. 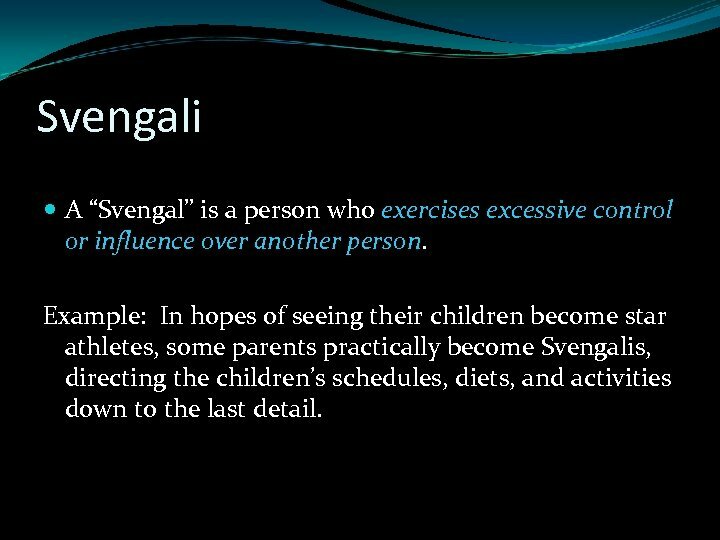 Svengali A “Svengal” is a person who exercises excessive control or influence over another person. Example: In hopes of seeing their children become star athletes, some parents practically become Svengalis, directing the children’s schedules, diets, and activities down to the last detail. 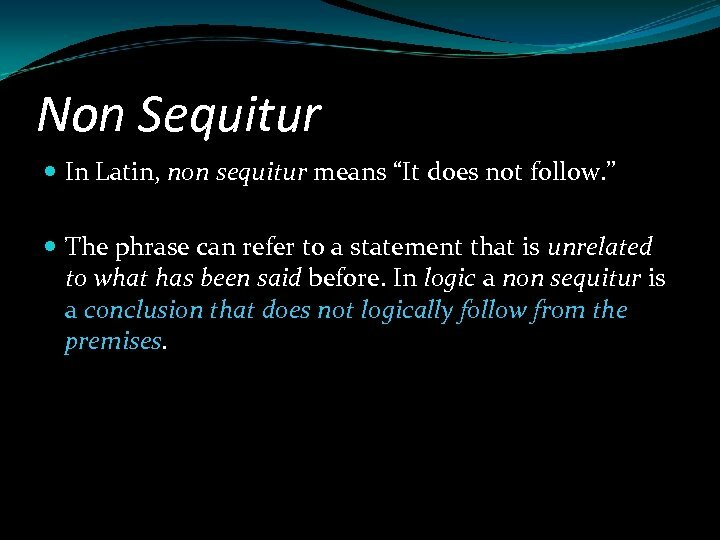 Non Sequitur In Latin, non sequitur means “It does not follow. 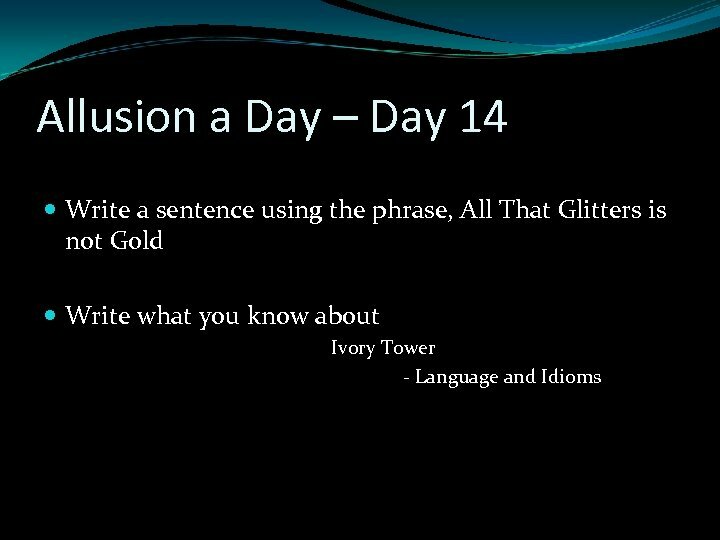 ” The phrase can refer to a statement that is unrelated to what has been said before. 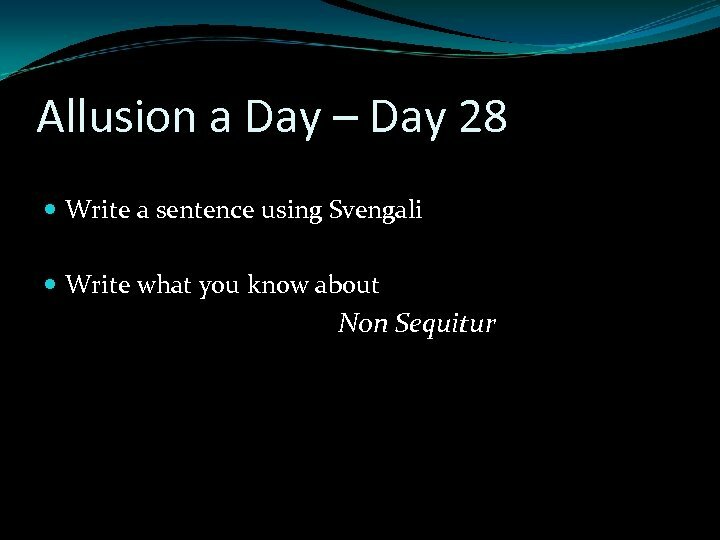 In logic a non sequitur is a conclusion that does not logically follow from the premises. Non Sequitur Example: In the middle of a lively discussion of the upcoming presidential election, my sister blurted out the fact that we were soon going to be getting a new kitten. This was a complete non sequitur, but it was understandable since she is only three years old. 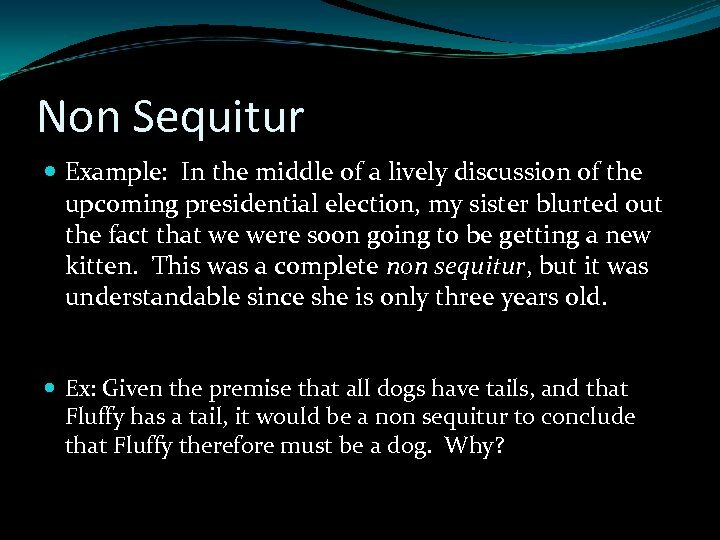 Ex: Given the premise that all dogs have tails, and that Fluffy has a tail, it would be a non sequitur to conclude that Fluffy therefore must be a dog. Why? 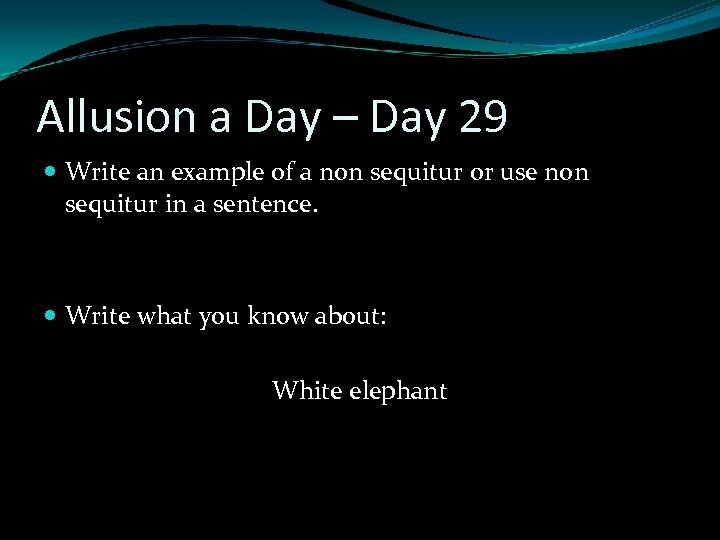 White Elephant White, or albino, elephants, do occur from time to time in India, Asia, and Africa. Because of their rarity, these elephants are considered special and are not subject to being beasts of burden and toil as other elephants are. 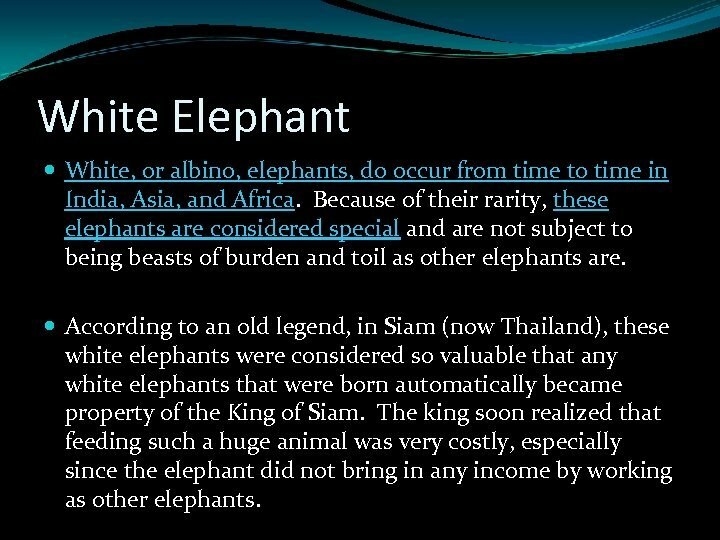 According to an old legend, in Siam (now Thailand), these white elephants were considered so valuable that any white elephants that were born automatically became property of the King of Siam. 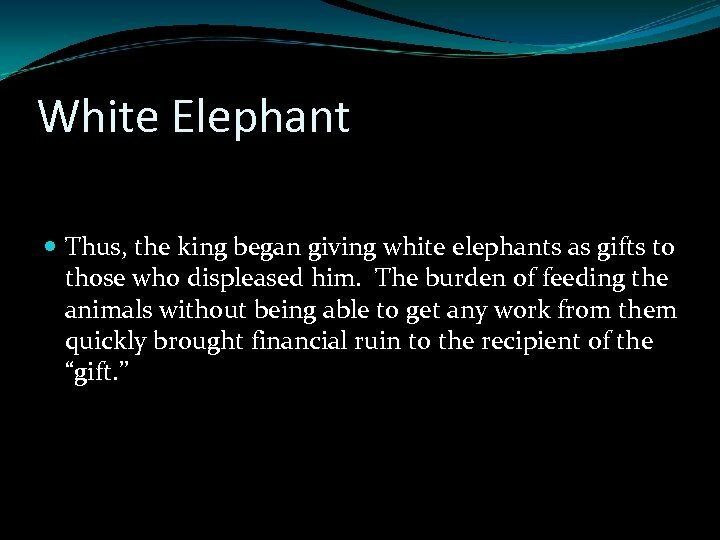 The king soon realized that feeding such a huge animal was very costly, especially since the elephant did not bring in any income by working as other elephants. 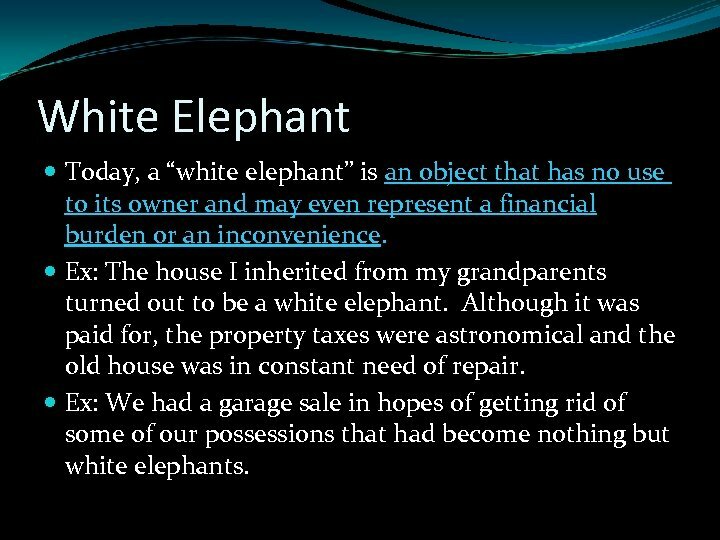 White Elephant Today, a “white elephant” is an object that has no use to its owner and may even represent a financial burden or an inconvenience. Ex: The house I inherited from my grandparents turned out to be a white elephant. Although it was paid for, the property taxes were astronomical and the old house was in constant need of repair. Ex: We had a garage sale in hopes of getting rid of some of our possessions that had become nothing but white elephants. 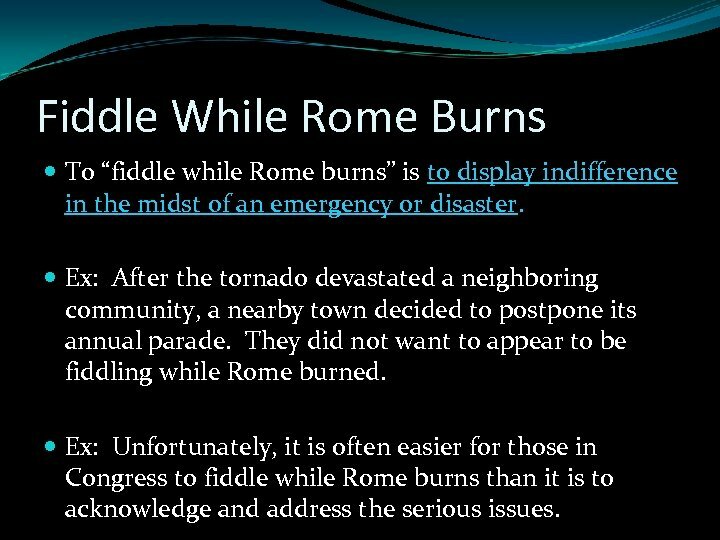 Fiddle While Rome Burns During the reign of the Roman emperor Nero, a fire consumed half of Rome. 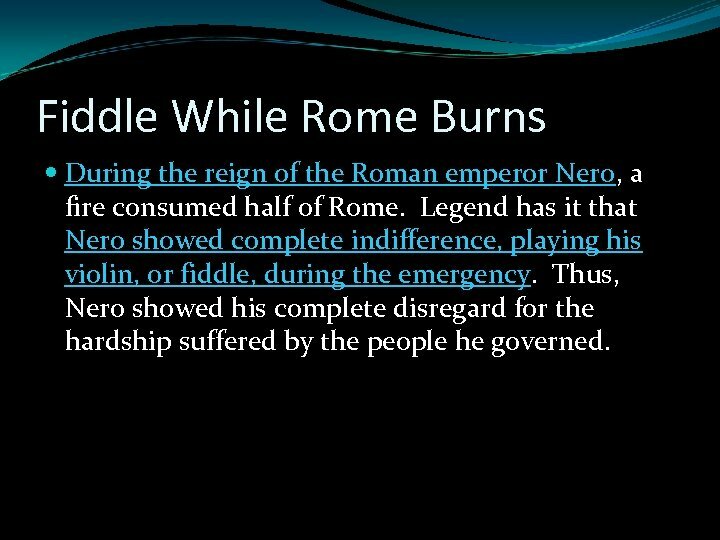 Legend has it that Nero showed complete indifference, playing his violin, or fiddle, during the emergency. Thus, Nero showed his complete disregard for the hardship suffered by the people he governed. Fiddle While Rome Burns To “fiddle while Rome burns” is to display indifference in the midst of an emergency or disaster. Ex: After the tornado devastated a neighboring community, a nearby town decided to postpone its annual parade. They did not want to appear to be fiddling while Rome burned. Ex: Unfortunately, it is often easier for those in Congress to fiddle while Rome burns than it is to acknowledge and address the serious issues. 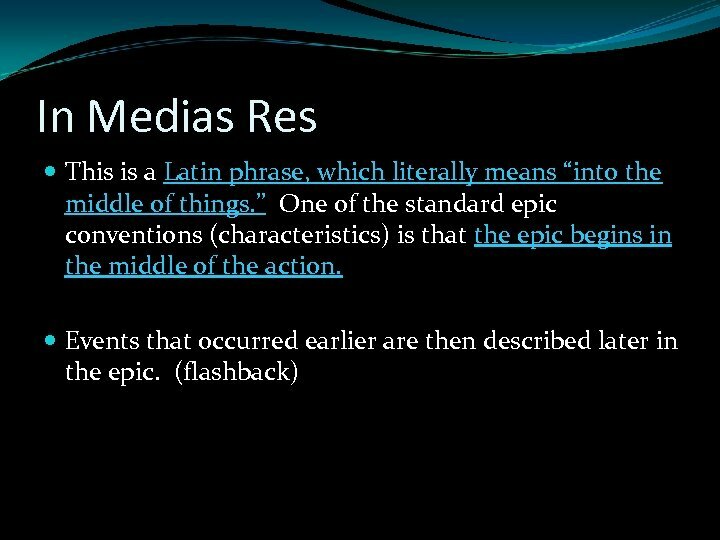 In Medias Res The phrase can refer to anything that “begins abruptly, in the middle of the action”, or it can be used in its literal sense: into the middle of things. 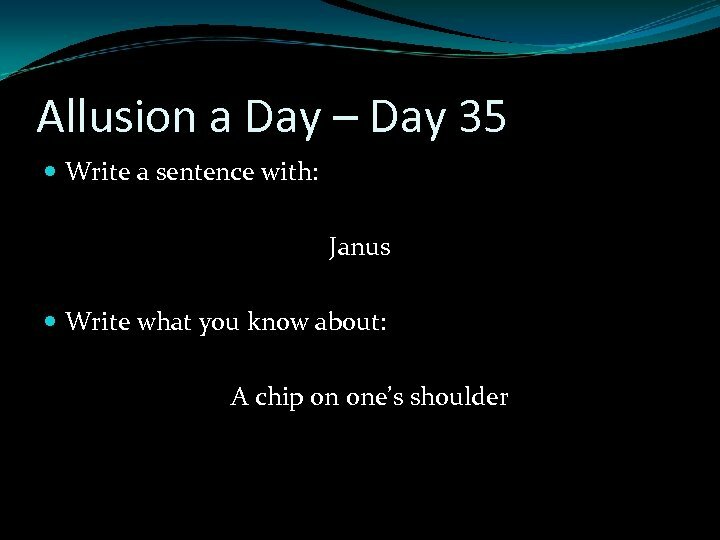 Ex: I was unable to understand what my friends were saying because I walked into the conversation in medias res. 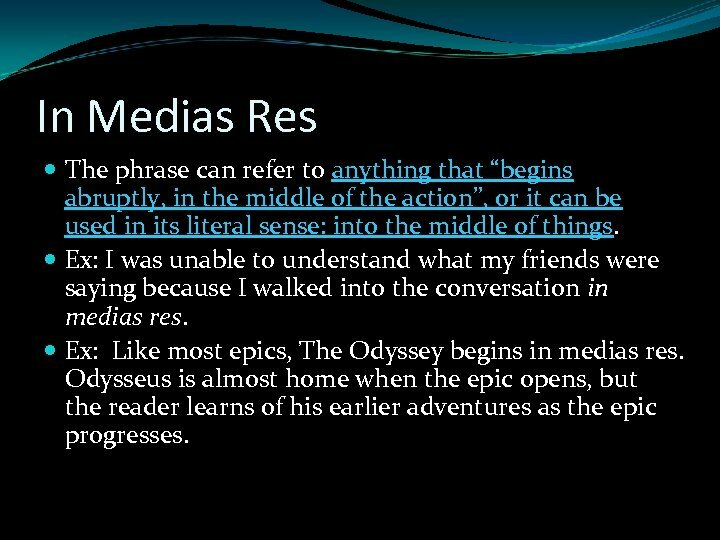 Ex: Like most epics, The Odyssey begins in medias res. 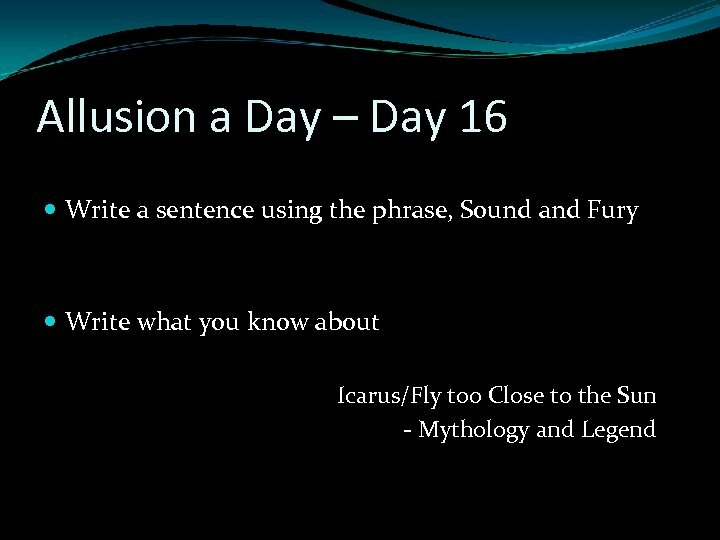 Odysseus is almost home when the epic opens, but the reader learns of his earlier adventures as the epic progresses. 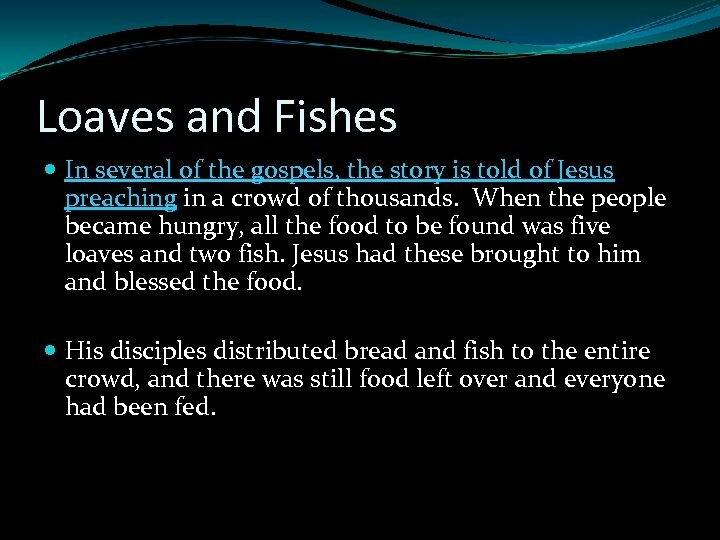 Loaves and Fishes In several of the gospels, the story is told of Jesus preaching in a crowd of thousands. When the people became hungry, all the food to be found was five loaves and two fish. Jesus had these brought to him and blessed the food. His disciples distributed bread and fish to the entire crowd, and there was still food left over and everyone had been fed. 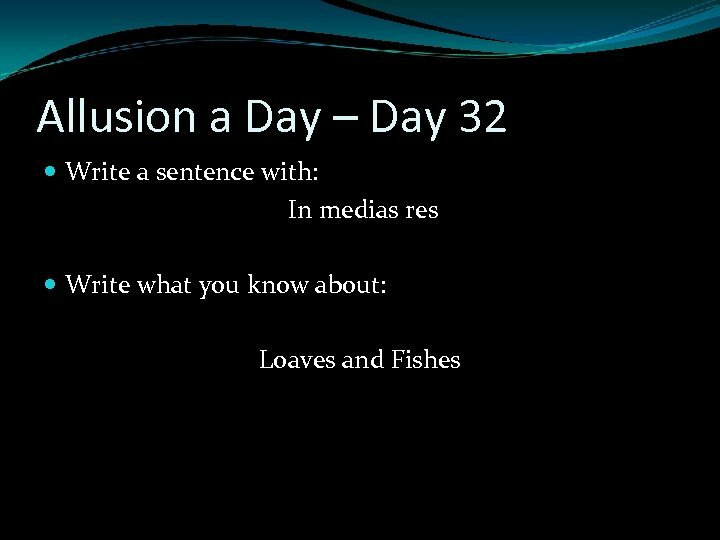 Loaves and Fishes The phrase “loaves and fishes” refers to an almost miraculous abundance in the face of seeming scarcity. 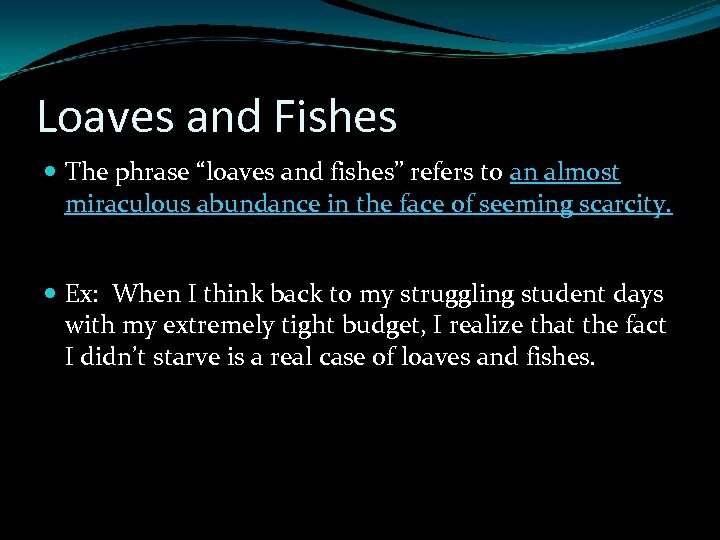 Ex: When I think back to my struggling student days with my extremely tight budget, I realize that the fact I didn’t starve is a real case of loaves and fishes. 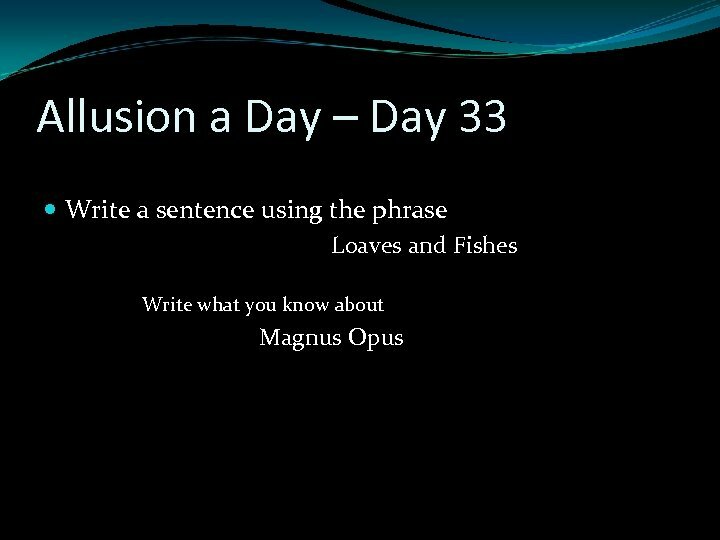 Magnus Opus This phrase in Latin means for “great work. 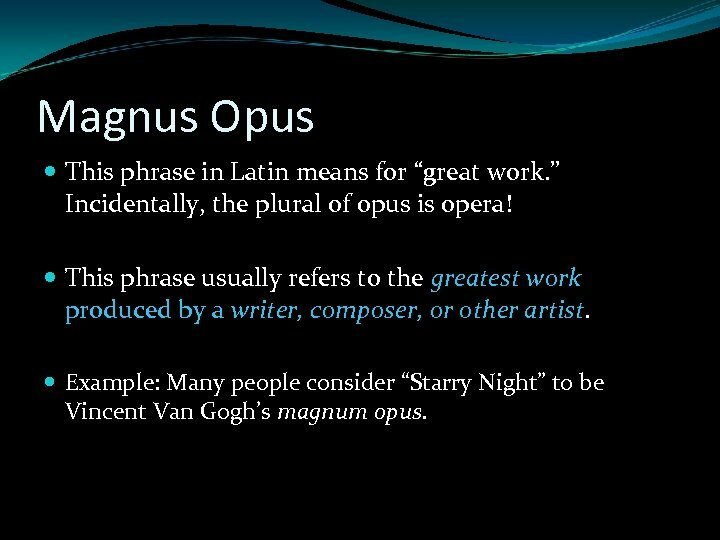 ” Incidentally, the plural of opus is opera! This phrase usually refers to the greatest work produced by a writer, composer, or other artist. Example: Many people consider “Starry Night” to be Vincent Van Gogh’s magnum opus. 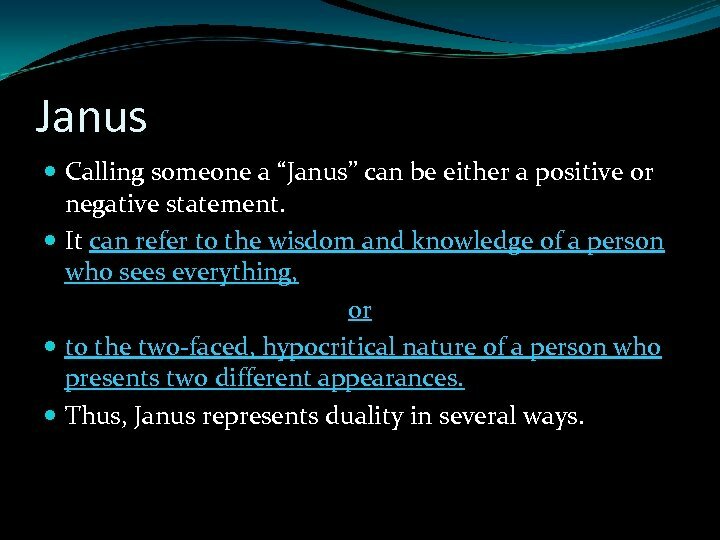 Janus Calling someone a “Janus” can be either a positive or negative statement. It can refer to the wisdom and knowledge of a person who sees everything, or to the two-faced, hypocritical nature of a person who presents two different appearances. Thus, Janus represents duality in several ways. 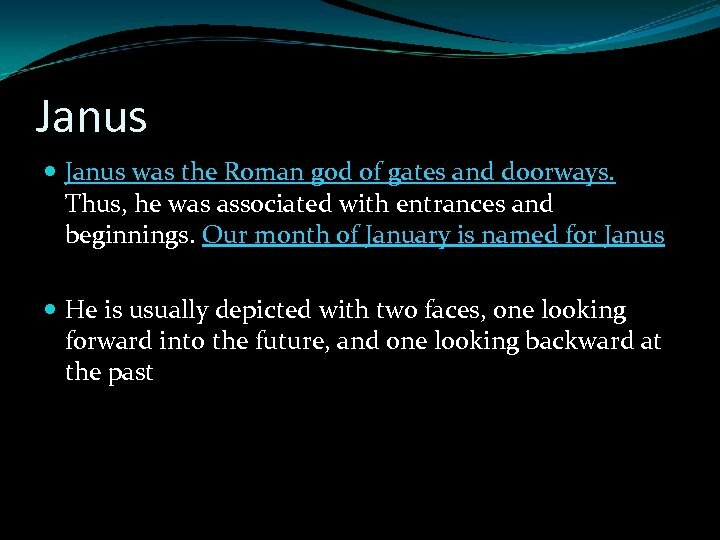 Janus Ex: One investment company calls itself “Janus”, implying that their firm has the big picture on investments—learning from the past and projecting the future of the markets. 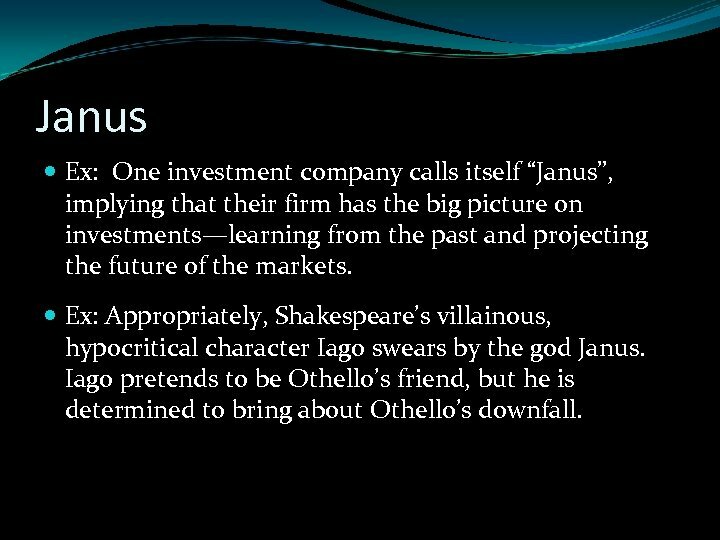 Ex: Appropriately, Shakespeare’s villainous, hypocritical character Iago swears by the god Janus. Iago pretends to be Othello’s friend, but he is determined to bring about Othello’s downfall. 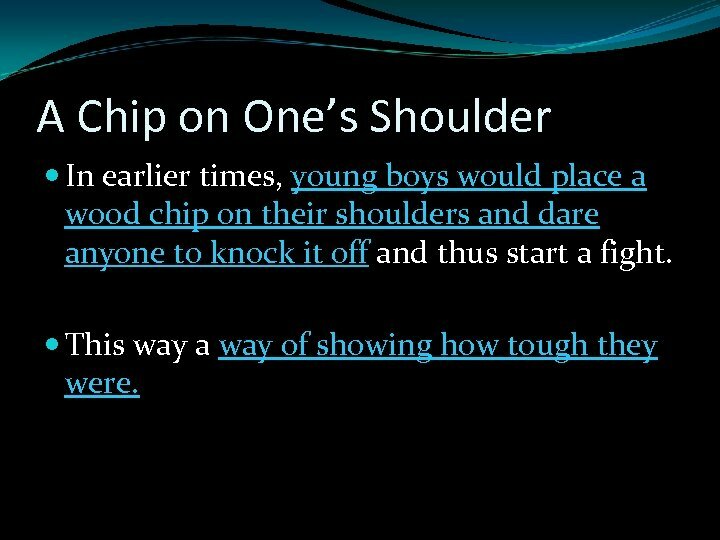 A Chip on One’s Shoulder In earlier times, young boys would place a wood chip on their shoulders and dare anyone to knock it off and thus start a fight. This way a way of showing how tough they were. 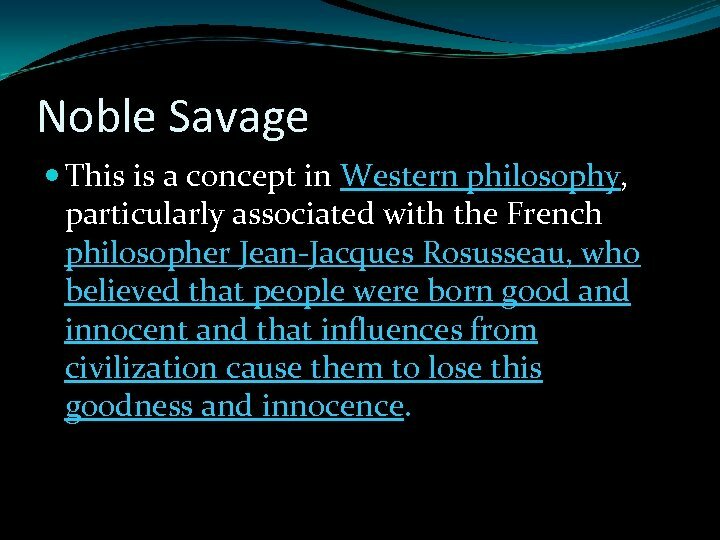 Noble Savage This is a concept in Western philosophy, particularly associated with the French philosopher Jean-Jacques Rosusseau, who believed that people were born good and innocent and that influences from civilization cause them to lose this goodness and innocence. Noble Savage A “noble savage” is a person who has not been corrupted by society or civilization. Ex: In his campaign for political office, the candidate attempted to convince voters that he was a noble savage as far as Washington was concerned. He would not play the political games like those who had been in Washington for a long time. 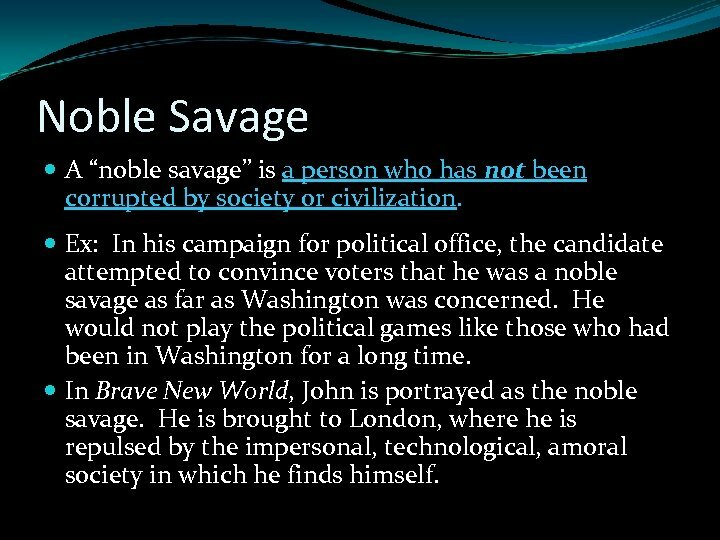 In Brave New World, John is portrayed as the noble savage. He is brought to London, where he is repulsed by the impersonal, technological, amoral society in which he finds himself. 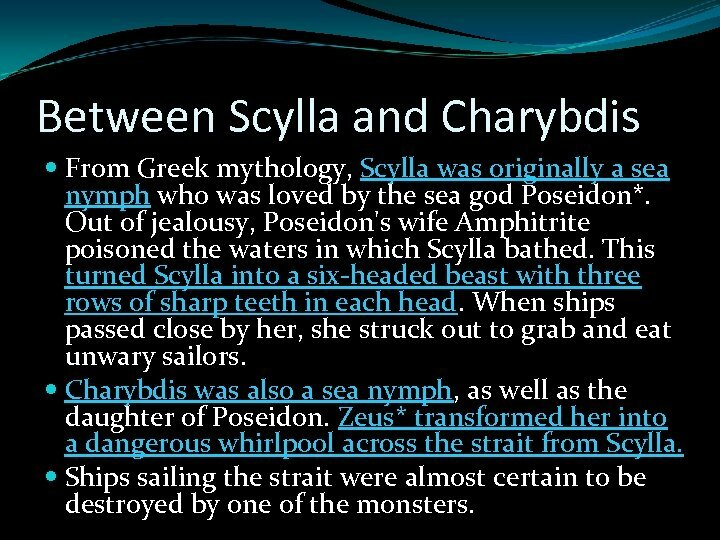 Between Scylla and Charybdis From Greek mythology, Scylla was originally a sea nymph who was loved by the sea god Poseidon*. Out of jealousy, Poseidon's wife Amphitrite poisoned the waters in which Scylla bathed. This turned Scylla into a six-headed beast with three rows of sharp teeth in each head. When ships passed close by her, she struck out to grab and eat unwary sailors. Charybdis was also a sea nymph, as well as the daughter of Poseidon. Zeus* transformed her into a dangerous whirlpool across the strait from Scylla. Ships sailing the strait were almost certain to be destroyed by one of the monsters. 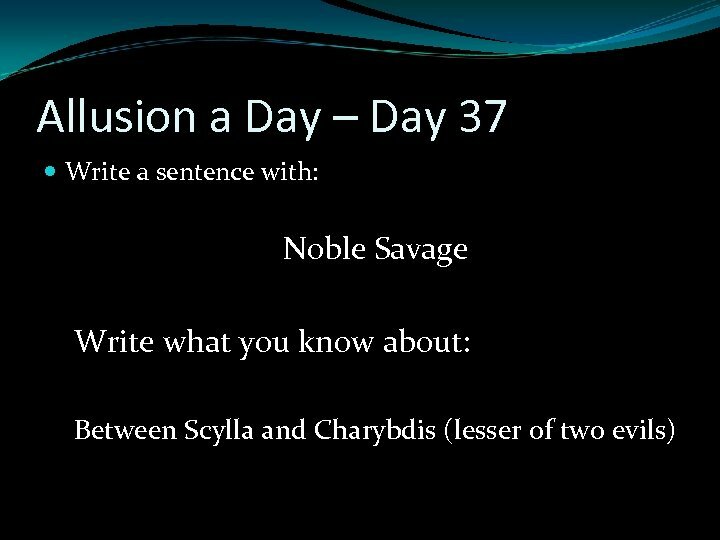 Between Scylla and Charybdis To be stuck “between Scylla and Charybdis” refers to a situation in which one has to choose between two equally unattractive options. Ex. 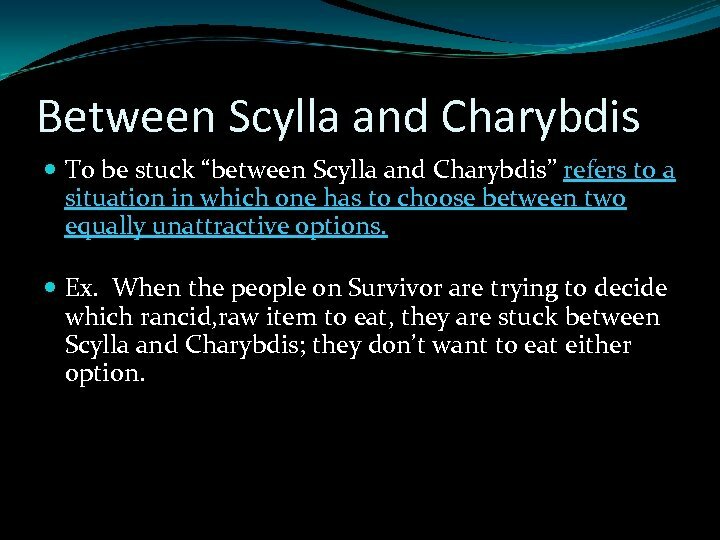 When the people on Survivor are trying to decide which rancid, raw item to eat, they are stuck between Scylla and Charybdis; they don’t want to eat either option. 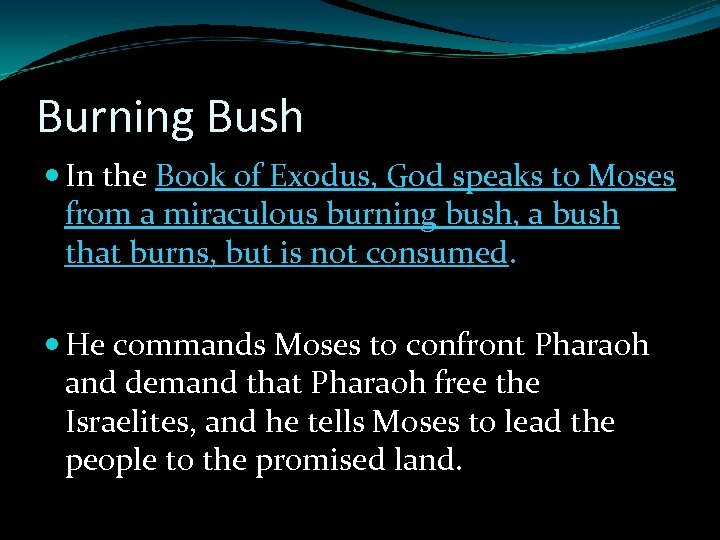 Burning Bush In the Book of Exodus, God speaks to Moses from a miraculous burning bush, a bush that burns, but is not consumed. He commands Moses to confront Pharaoh and demand that Pharaoh free the Israelites, and he tells Moses to lead the people to the promised land. 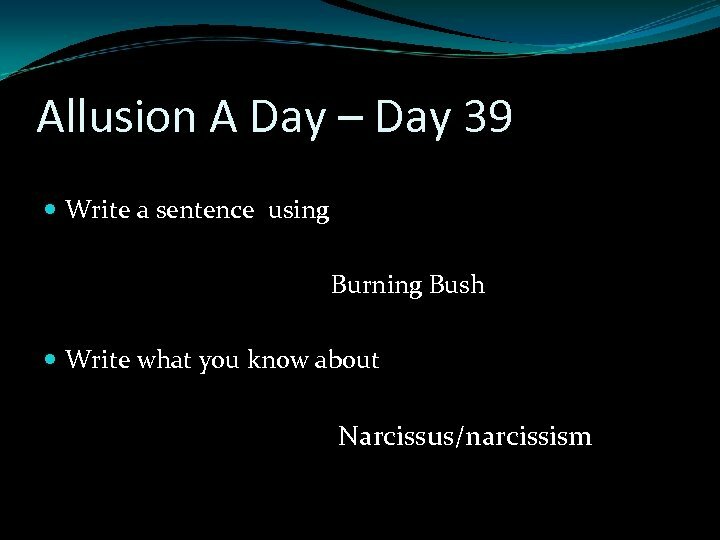 Burning Bush A “burning bush” refers to a medium through which the voice of absolute authority speaks. 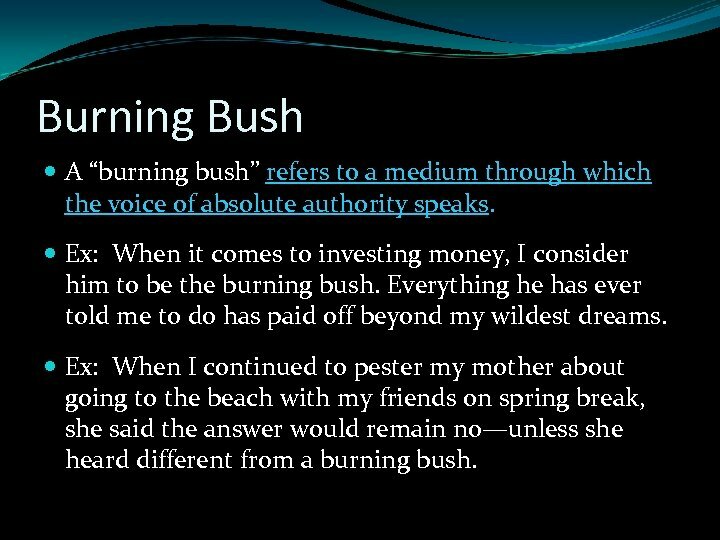 Ex: When it comes to investing money, I consider him to be the burning bush. Everything he has ever told me to do has paid off beyond my wildest dreams. Ex: When I continued to pester my mother about going to the beach with my friends on spring break, she said the answer would remain no—unless she heard different from a burning bush. 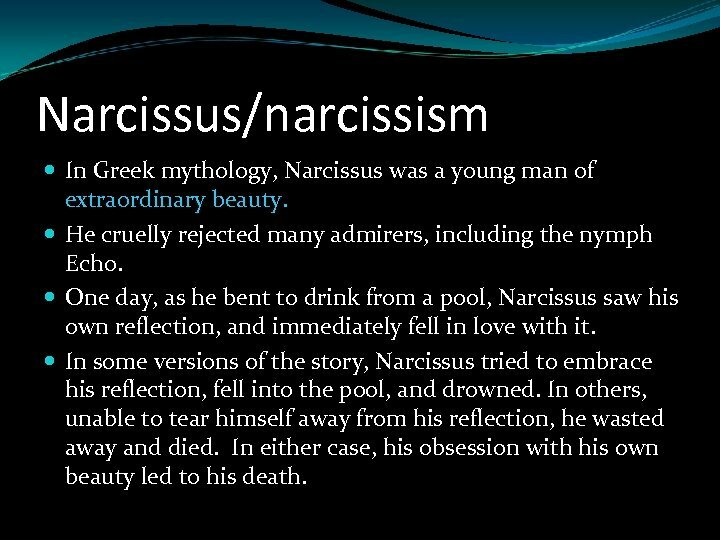 Narcissus/narcissism In Greek mythology, Narcissus was a young man of extraordinary beauty. He cruelly rejected many admirers, including the nymph Echo. One day, as he bent to drink from a pool, Narcissus saw his own reflection, and immediately fell in love with it. In some versions of the story, Narcissus tried to embrace his reflection, fell into the pool, and drowned. In others, unable to tear himself away from his reflection, he wasted away and died. In either case, his obsession with his own beauty led to his death. 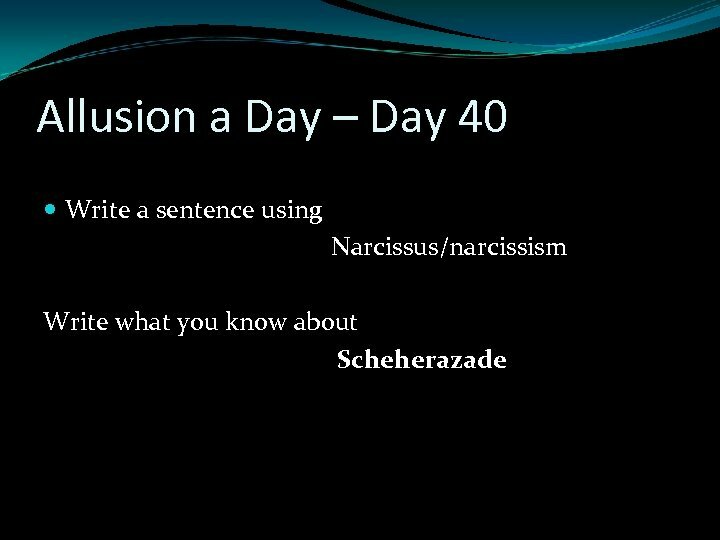 Narcissus/narcissism The term “narcissism” is derived from the story of Narcissus. It refers to obsessive focus on oneself, particularly one’s physical appearance. 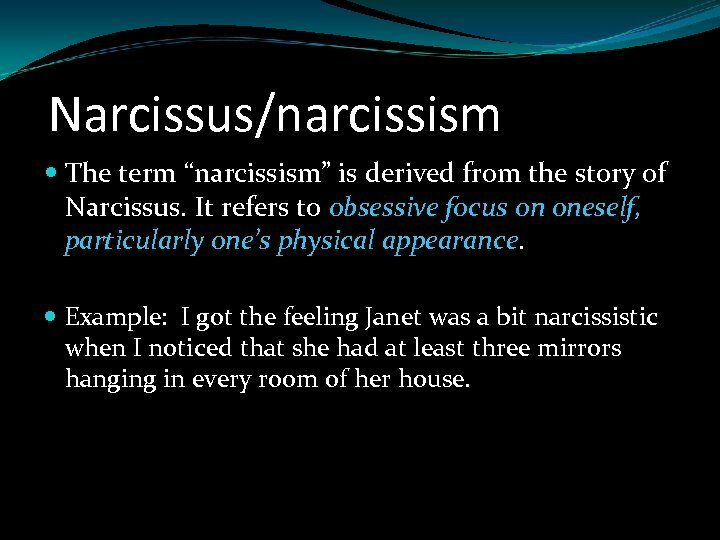 Example: I got the feeling Janet was a bit narcissistic when I noticed that she had at least three mirrors hanging in every room of her house. 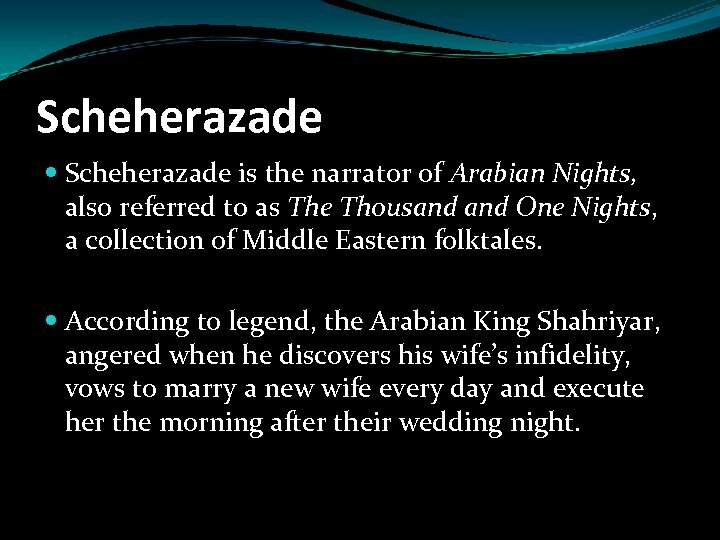 Scheherazade is the narrator of Arabian Nights, also referred to as The Thousand One Nights, a collection of Middle Eastern folktales. According to legend, the Arabian King Shahriyar, angered when he discovers his wife’s infidelity, vows to marry a new wife every day and execute her the morning after their wedding night. 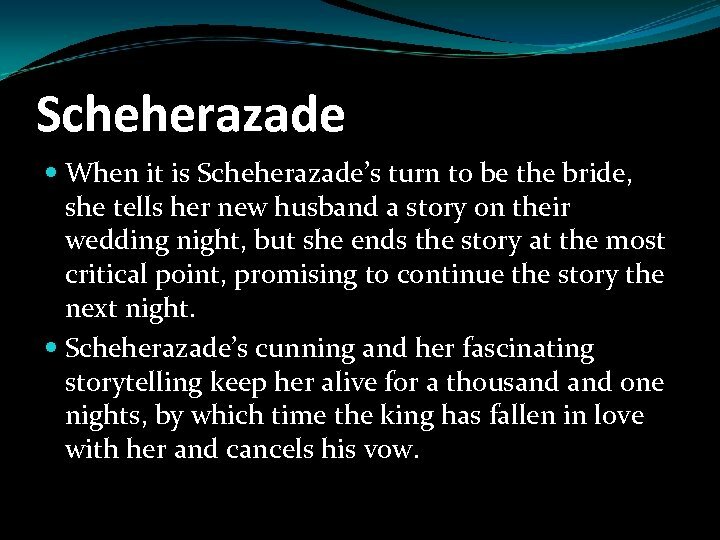 Scheherazade When it is Scheherazade’s turn to be the bride, she tells her new husband a story on their wedding night, but she ends the story at the most critical point, promising to continue the story the next night. Scheherazade’s cunning and her fascinating storytelling keep her alive for a thousand one nights, by which time the king has fallen in love with her and cancels his vow. 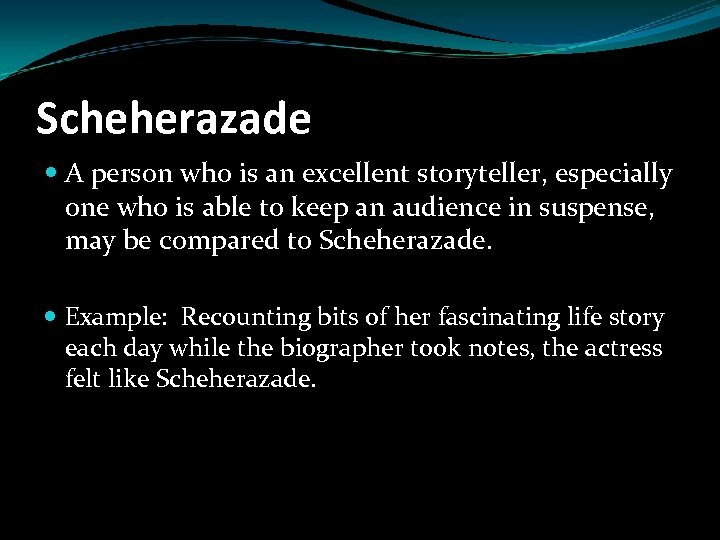 Scheherazade A person who is an excellent storyteller, especially one who is able to keep an audience in suspense, may be compared to Scheherazade. 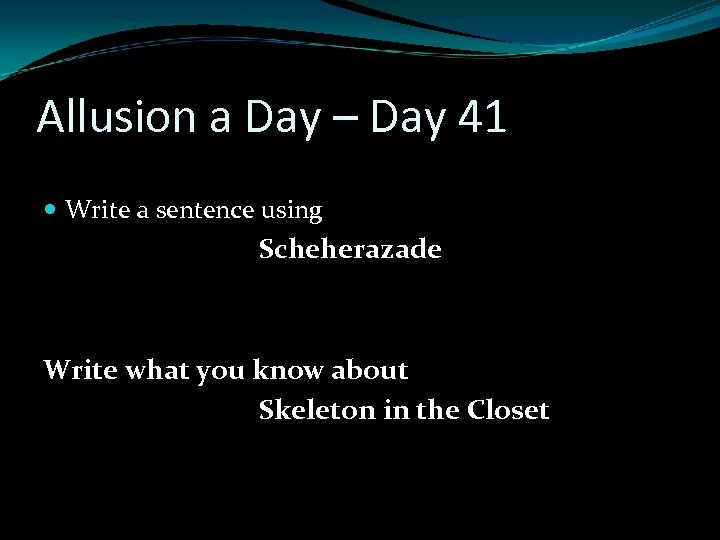 Example: Recounting bits of her fascinating life story each day while the biographer took notes, the actress felt like Scheherazade. Skeleton in the Closet Long after a person has died and the body has decomposed, the skeleton remains. Skeletons can be unpleasant or frightening to look at. 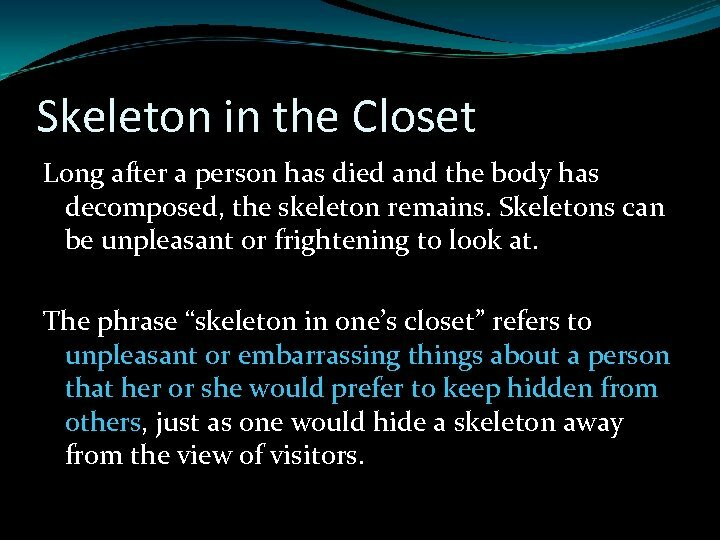 The phrase “skeleton in one’s closet” refers to unpleasant or embarrassing things about a person that her or she would prefer to keep hidden from others, just as one would hide a skeleton away from the view of visitors. 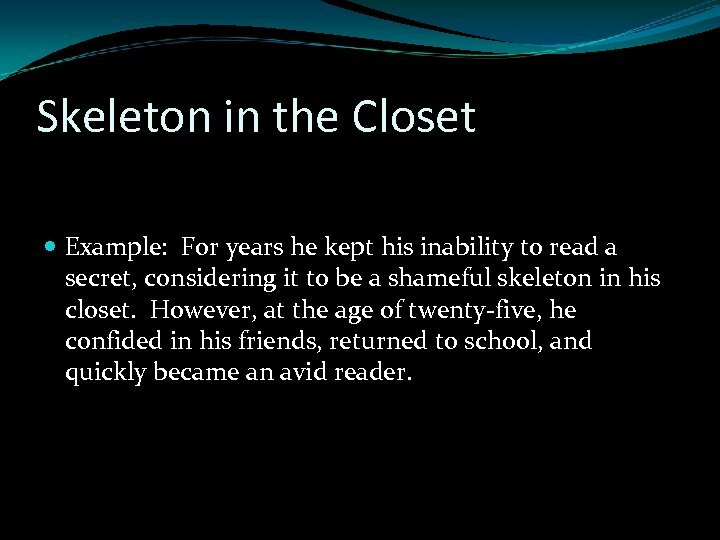 Skeleton in the Closet Example: For years he kept his inability to read a secret, considering it to be a shameful skeleton in his closet. However, at the age of twenty-five, he confided in his friends, returned to school, and quickly became an avid reader. 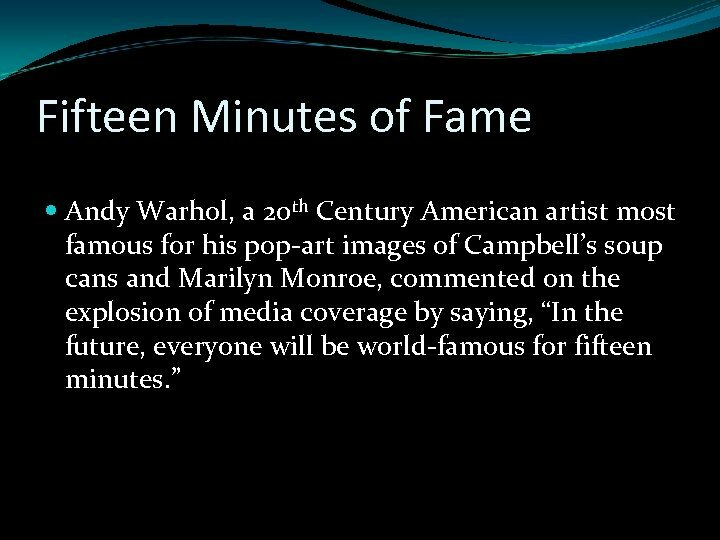 Fifteen Minutes of Fame Today, when someone receives a great deal of media attention for something fairly trivial, he or she is said to be experiencing his/her “fifteen minutes of fame. 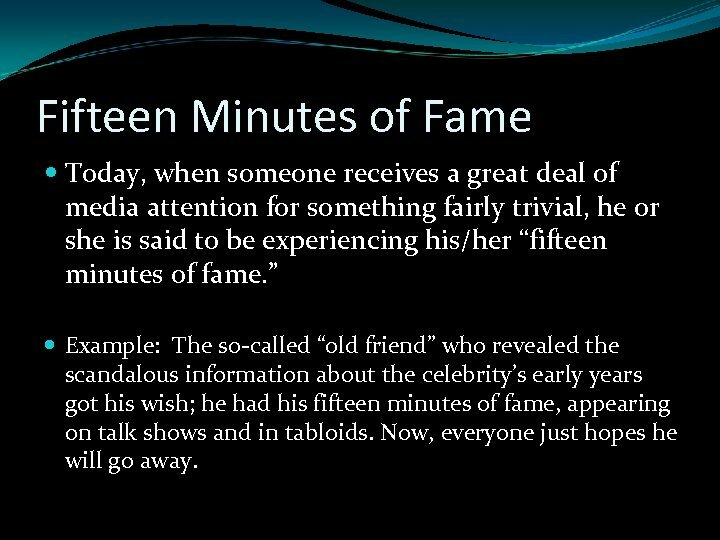 ” Example: The so-called “old friend” who revealed the scandalous information about the celebrity’s early years got his wish; he had his fifteen minutes of fame, appearing on talk shows and in tabloids. Now, everyone just hopes he will go away. 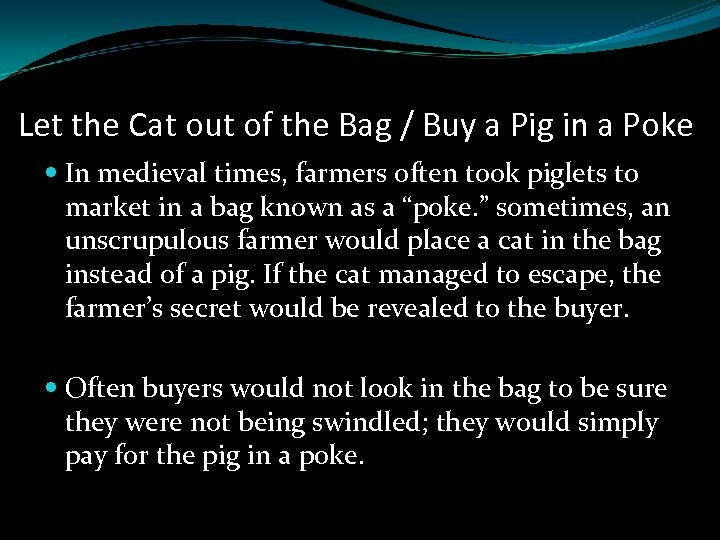 Let the Cat out of the Bag / Buy a Pig in a Poke In medieval times, farmers often took piglets to market in a bag known as a “poke. ” sometimes, an unscrupulous farmer would place a cat in the bag instead of a pig. If the cat managed to escape, the farmer’s secret would be revealed to the buyer. Often buyers would not look in the bag to be sure they were not being swindled; they would simply pay for the pig in a poke. Let the Cat out of the Bag / Buy a Pig in a Poke We use the phrase “letting the cat out of the bag” to refer to a secret’s being revealed. The phrase “buying a pig in a poke” describes buying something sight unseen. Buying a pig in a poke is considered unwise because of the risks involved. 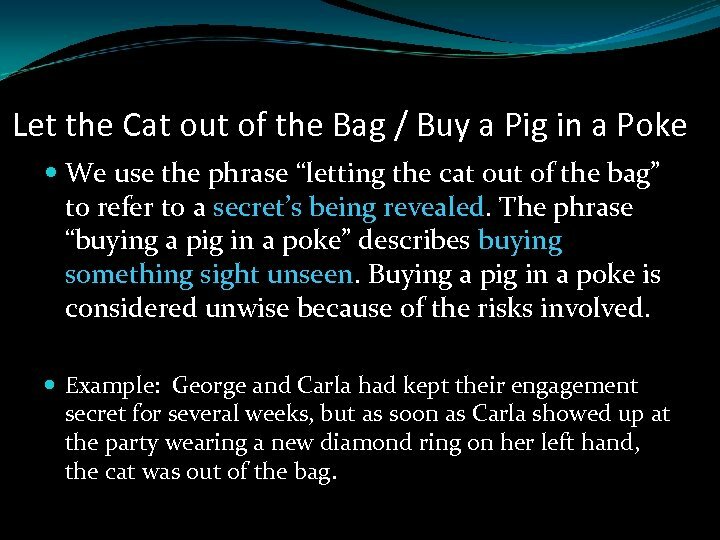 Example: George and Carla had kept their engagement secret for several weeks, but as soon as Carla showed up at the party wearing a new diamond ring on her left hand, the cat was out of the bag. 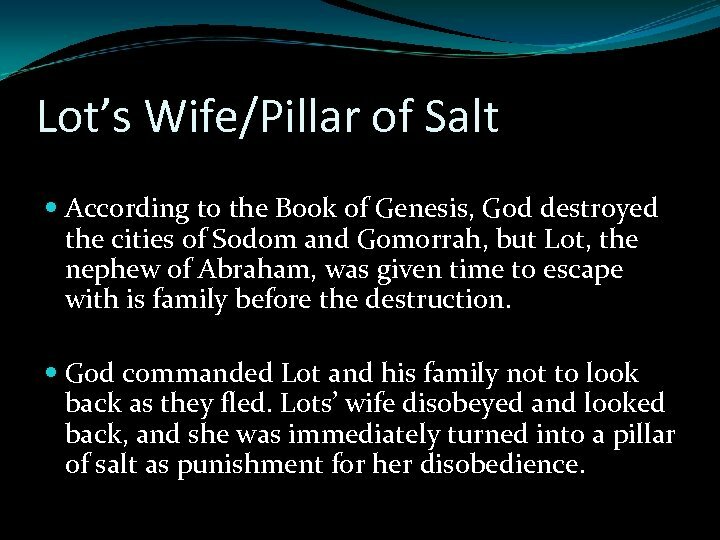 Lot’s Wife/Pillar of Salt According to the Book of Genesis, God destroyed the cities of Sodom and Gomorrah, but Lot, the nephew of Abraham, was given time to escape with is family before the destruction. God commanded Lot and his family not to look back as they fled. Lots’ wife disobeyed and looked back, and she was immediately turned into a pillar of salt as punishment for her disobedience. 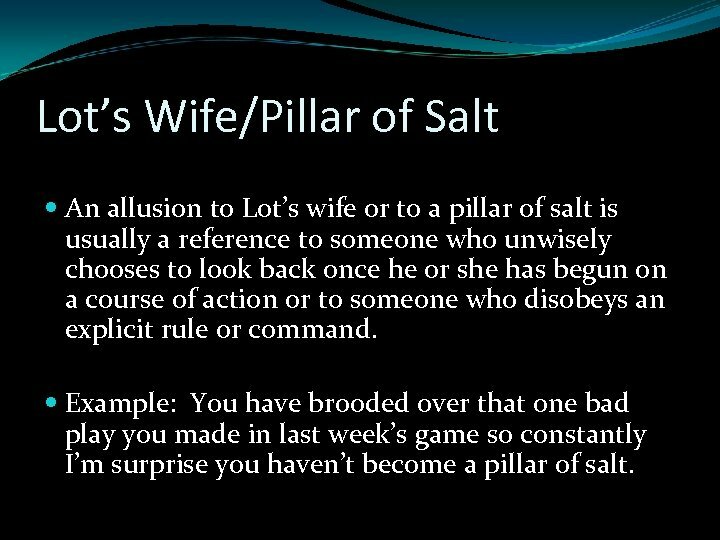 Lot’s Wife/Pillar of Salt An allusion to Lot’s wife or to a pillar of salt is usually a reference to someone who unwisely chooses to look back once he or she has begun on a course of action or to someone who disobeys an explicit rule or command. 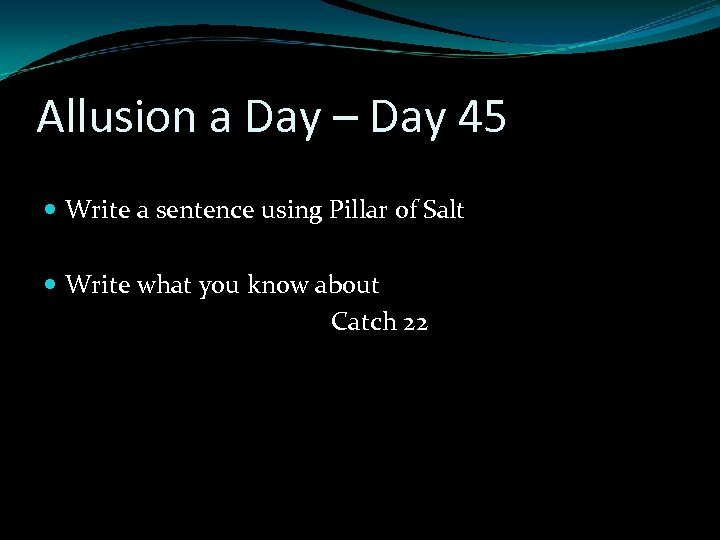 Example: You have brooded over that one bad play you made in last week’s game so constantly I’m surprise you haven’t become a pillar of salt. 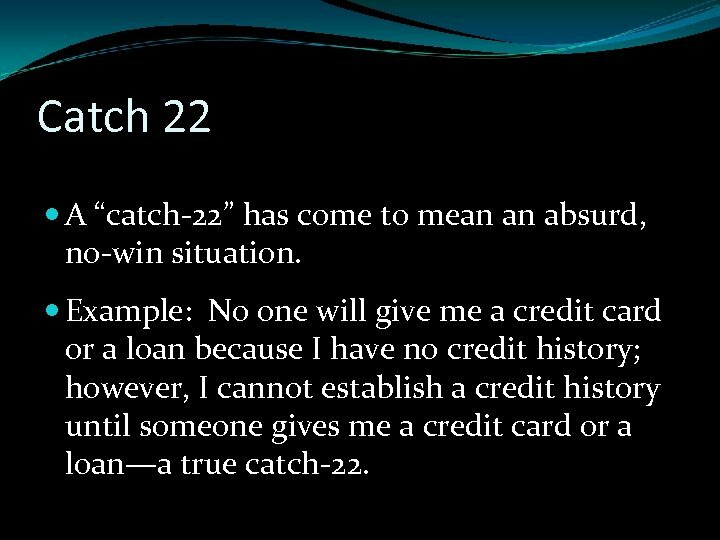 Catch 22 This phrase comes from the novel by Joseph Heller. Catch-22 is set on the U. S. Army Air Force base in World War II. 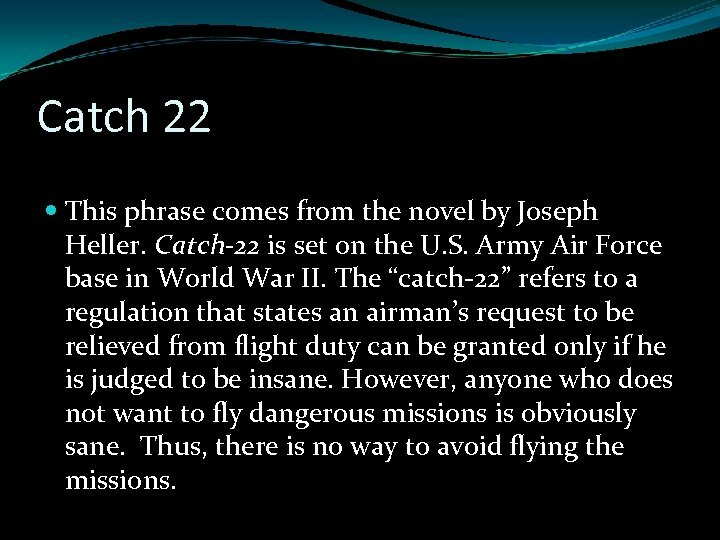 The “catch-22” refers to a regulation that states an airman’s request to be relieved from flight duty can be granted only if he is judged to be insane. However, anyone who does not want to fly dangerous missions is obviously sane. Thus, there is no way to avoid flying the missions. Catch 22 A “catch-22” has come to mean an absurd, no-win situation. Example: No one will give me a credit card or a loan because I have no credit history; however, I cannot establish a credit history until someone gives me a credit card or a loan—a true catch-22.